The first alarm went off in 2001 when a request by the Central Bank of Kenya (CBK) to the Charter House Bank (CHB) asking for full details about a US$20 million transaction was ignored. The second alarm came in 2004, after an internal auditor at CHB blew the whistle over alleged malpractices. A third and final one occurred in 2006. The shadow finance minister, Billow Kerrow, presented documents alleging blatant and widespread tax evasion by a net of companies over a period of six years. Welcome to what it is believed to be Kenya’s largest tax evasion and money laundering scam, said to be worth about US$1.5 billion. Few are the certainties that surrounds the Charter House Bank scandal. One is that „anyone who probed the operations of CHB has been either moved off the case or has fled the country“, said one of the key-whistleblowers, Titus Mwirigi, to BBC in 2006. As internal auditor, Odhiambo had free access to the bank’s transaction documents. According to the cable sent from the American embassy, in 2004 he collected information on 85 accounts held at the bank through which, he claimed, a tax evasion scam worth US$ 573 million was perpetrated. There is even room for some old fashioned dirty tricks. In September 2004, a fire at the CHB offices supposedly burnt to ashes a huge number of documents related to financial transactions prior to April 2004. Future audit bodies would cite the fire — as well as the unwillingness to cooperate by the bank staff — as the reason why the bank’s transfer details were not available. The companies that Odhiambo identified as being involved in tax evasion and money laundering were associated with Nakumatt Holdings: Nakumatt Supermarkets, Tusker Mattresses, Kingsway Tyres, Creative Innovations and Village Market. A Central Bank of Kenya report went further and added the John Harun Group, Triton Petroleum, law firm Kariuki Muigua & Co. and Pepe Enterprises Ltd were also linked to the Nakumatt Holdings, stating that „they are undoubtedly involved in significant tax evasion if not other economic crimes“. Nakumatt owns over 50 supermarket stores in Rwanda, Uganda and Tanzania and is the largest supermarket chain in Kenya. Its story began in 1978, when it was launched by Manganlal Shah. Shah is an Indian businessman who emigrated to Kenya in 1947. He started running a clothing shop near Embakasi, named Vimal Fancy Store after his first-born child, Vimal. He moved to Nakuru town in 1952, and 20 years later he was bankrupt. In Nakuru, he started working as clerk for Nakuru Mattress, a big retail shop. His sons Vimal and Atul opened a corner shop in the same neighbourhood. In a couple of years they earned enough to buy Nakuru Mattress, changing its name to Nakumatt. The average annual turnover of the company is 45 billion KSH (€450 mln) and the company assets are valued at 11 billion KSH (€110m). The ownership is divided into the Atul Shah family (92,3%) and Hotnet Limited (7,7%). Numerous sources report that one of the wealthiest and most influential businessman in Kenya holds part of the shares at Hotnet. Meet John Harun Mwau, former cop and politician, entrepreneur and, last but not least, according to the U.S. Foreign Narcotics Kingpin Designation Act, one of world’s most dangerous „Drug kingpins“. “Charter House was supposed to be Mwau’s bank to launder money“, said John Githongo, Kenyan journalist and former Transparency International board member, during a phone interview. Githongo’s voice is not alone. A U.S. embassy cable released by Wikileaks details similar testimony from Peter Odhiambo, former internal auditor at Charter House. The U.S. outpost in Kenya also believed former Kenya MP William Kabogo holds shares in Hotnet. 2006 was the turn of MP Billow Kerrow, who exposed the results of a leaked task force investigation conducted into CHB. The MP publicly linked Nakumatt Holdings and Charter House Bank to money laundering and tax evasion, alleging also that the supermarket company held a 10 percent stake in the bank. The report noticed how the CHB allowed money to flow to a network of companies and persons through unregistered or illicit transfers. PwC registered numerous cases of large cash transactions, both as deposits and as withdrawals. In the auditors opinion, this „indicated an intention to conceal the true source of the beneficiary of the payments made“, with each withdrawal averaging US$ 11.000. A typical modus operandi was to split a large amount of money into smaller transactions, in order not to raise suspicion within the bank’s own regulatory system: „a common practice among money launderers“, AfriCOG said. Exemplary is the case of mysterious Italian businessman, Paolo Sattanino, born in Turin in 1964. Sattanino currently works in Lugano, Switzerland, at Mercurio Corporate SA, a joint stock company. He is the founder of Eporedia srl, Mego srl and Tradex srl, all Turin based. By holding several accounts at CHB as a legal person and as owner of the Italian companies he owned (Capricorn Srl and Tradex Srl), Sattanino received a number of payments of the same amount within consecutive days, as shown in the image below. Sattanino received payments from Cargo Distributors, Kingsway Mart Ltd, Creative Innovations Ltd, Brand Imports Ltd, Aua Industria Ltd. According to the AfriCOG report, he then instructed the bank to transfer the money abroad without any relevant documentation, as required for transfers above US$10.000. Send hundreds of payments from different senders to numerous receivers, and you have laundered millions and bypassed financial regulations. Journalists could not reach Sattanino for comment and the phones numbers registered to companies in which he owns shares ring endlessly. His lawyer Mauro Anetrini spoke on his behalf: „The whole story has never had any judicial consequence for my client, the Wikileaks files show that reports found wrongdoings within the bank, not from Mr Sattanino. If they asked him to provide all necessary documents he would have done so, but they never did. Besides, it is my knowledge that no investigation was done on him, why should he provide them?“. To clear his name, suggested journalists. „Ok, then, I shall ask whether he still has any“, Anetrini said. Another peculiar Italian entrepreneur involved in the CHB scandal is Francesco Tramontano, a media businessman based in Dar Es Salaam, Tanzania. He is reported as having made several transfers amounting to € 80.000 to Sattanino’s bank accounts, both under his name and the Africa Media Group he controls. According to a document issued by a Belgian parliamentary committee in 2003, Tramontano was sentenced in absentia for having organised a group of people who defrauded the Belgian Development Office of €2.235.000 in aid funds. Extradition attempts sent to Tanzania have so far proved unsuccessful. A 2012 study shows how easy it is to launder money in Kenya using shell companies. A common method was to move money across financial borders. Researchers from the University of Texas, Griffith University and Brigham Young University found that, out of 182 countries, Kenya was the least likely to ask for identification documents when people opened a shell company. With Nairobi being the financial center of the entire East African region, this makes Kenya a natural target for money launderers. The need for money laundering facilities is exacerbated by the constant political and social instability of Kenya’s neighboring countries, Somalia, Ethiopia and South Sudan. “Another common practice in money laundering involves sending the money through a complex web of financial transactions to change its form and make it difficult to follow. Referred to as layering, it may involve myriad bank-to-bank transfers, transfers between different accounts in different names and countries to related companies, changing the money’s currency and form and so on. This is aimed at ensuring that the original illegal proceeds become difficult to trace. The PwC audit found a number of accounts that had similar patterns of transactions. “The proceeds of drug trafficking move through the banking system“, John Githongo tells IRPI. „In terms of movement of drug money, Kenya now rates higher even than Nigeria due to the rise of narcotics moving in and through the country, but also because of the sophisticated fiscal system that Kenya’s represents“, he adds. Not one of the many investigations by Kenyan authorities into the Charter House scandal saw a single person in court. The bank was closed in 2006 but perpetrators are still running Kenya’s financial system, undetected or protected by secrecy. “Normally this type of scandal would call for a transparent investigation, if the findings suggest that a criminal conduct took place then it’s the duty of the prosecution authority to call for a police investigation. The problem with countries like Kenya where the political elites have immunity is that justice is rarely made“, tells us Global Initiative Against Transnational Organised Crime senior advisor Peter Gastrow. In 2010, a Parliamentary committee cleared Charterhouse bank of any wrongdoing and suggested it be reopened. Instead of opening the bank, the Kenya Anti-Corruption Commission (KACC) announced that it would reopen the investigation after receiving a file from the U.S. embassy, allegedly containing details of Ksh 60 billion ($738.5 million) worth of financial malpractice by Charterhouse Bank. This project is produced by journalism centres IRPI, ANCIR, CORRECTIV with QUATTROGATTI and made possible by IDR Grant and Journalismfund. In April and November last year, the Australian navy seized two consignments of heroin off the coast of Kenya, totalling 787 kg and worth about USD278m. Another haul was made in July when Kenyan police found 342 kg of heroin in the tank of a ship docked at the Mombasa port, making it the biggest ever single seizure of drugs in Kenya coastal city. The three seizures roughly equalled the amount captured by 11 east African governments between 1990 and 2009, according to the U.N. Office on Drugs and Crime. 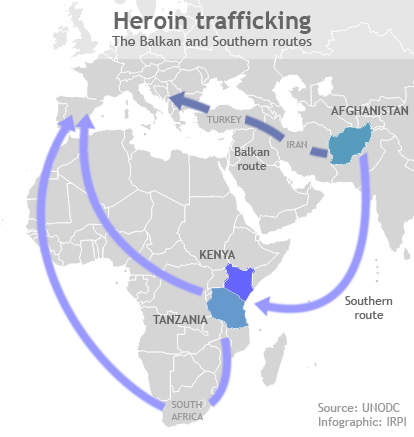 The hauls proved once again how Kenya and East Africa waters have become a key export route for heroin from Asia to Europe. In December 2004 a seizure marked a turning point in Africa drugs trade. It was the biggest ever: 1.1 tonnes coming in a vessel docked at Mombasa port. Cocaine has been seized in Malindi, Mombasa (837.5 Kg) and Nairobi (304 Kg). The street value was estimated in 80 million USD. Narcotics allegedly came from Colombia through Venezuela. This large cocaine seizure haul involved all the big players both in politics and drug trafficking in Kenya. Politician and businessman, John Harun Mwau, was born in Kenya in 1948 to a humble family. But by the 1990s, he was a rich man. Two decades later, he is richer still. Last year, the Mwau family was named in the 2014 ‘Wealth in Kenya’ report as one of the richest in the country. And the US government is currently seeking to confiscate 750 millions dollars he has investied there: in 2011 Obama’s administration blacklisted him in the “Kingpin act”. Mwau’s vast wealth is not from honest hard work. He is Kenya’s biggest drug trafficker, and in two decades has earned hundreds of millions of dollars from illegally moving cocaine into Kenya, the United States and Europe. Mwau began his career as a sharpshooter in the Kenyan police in his 20s. He joined the Kenyan parliament in the Kilome province in 1992 under his own brand new political party: PICK (Party of Independent Candidates of Kenya). He left his seat in 2013. Mwau ran also for the Kenyan presidency in 1992. He lost. But then president, Daniel Arap Moi, offered him the role of head of the newly-created Kenya Anti-Corruption Authority. His job as „transparency upholder“ lasted just a few months. After keeping a low profile for several years, he emerged again as a major importer of electronic goods from the Middle East and Europe. But troubles for Mwau started in 2004. In December that year, Kenyan authorities seized in Nairobi, Mombasa and Malindi an astonishing 1,21 tonnes of cocaine. The African Business magazine suggests the cargo came from Venezuela and Colombia, and was destined for Ireland and the Netherlands. It was the largest drug haul ever in Kenya’s history. Shortly after, investigators raided the depot of Pepe Enterprises Ltd, a Mombasa -based company allegedly owned by John Mwau. The company has a warehouse located at the Athi River in the outskirts of Nairobi, where it is suspected that part of the narcotics shipment found its way there. The same newspaper reported that Kenya’s Criminal Investigation Department (CID) „refused to identify a prominent Nairobi hotelier being investigated over the shipment“. The 2012 report “Termites at Work: Transnational Organized Crime and State Erosion in Kenya“ released by the International Peace Institute (IPI), highlighted that Mwau has „also been contracted by the government over many years to operate an inland container depot at Athi River in the outskirts of Nairobi, known as the Pepe Container Freight Station“. The report named Mwau as a violent drug dealer involved in money laundering and contract killings. „In 2008,” the report continues, “John Harun Mwau, following his appointment as assistant transport minister, appears to have been responsible for Kenya’s container transport arrangements“ and „for the Kenya Ports Authority (KPA), which controls all ports of entry and inland container terminals in Kenya“. The manager of the depot was charged for drug trafficking but was acquitted for lack of evidence”4. IPI interview with Njuguna Mutonya, former bureau chief of Nation Media Group, Coast Province, August 18, 2010. But the toughest blows to Mwau’s jaw were yet to come. Prior to 2007, Mwau was under investigation with two other suspects for having allegedly provided large sums of money to the election coffers of the PNU (Party of National Unity), headed by Mwai Kibaki, at that time the Kenyan president. Mwau resigned from his trade assistant minister post in December 2010 after Internal Security minister, George Saitoti, informed the Parliament that MPs Ali Hassan Joho, William Kabogo, John Harun Mwau and Gideon Mbuvi, and Mombasa tycoon Ali Punjani were being investigated for alleged drug trafficking. According to local press reports, Mwau’s resignation came one month after U.S. ambassador for Kenya, Michael Ranneberger, handed over a detailed confidential report made by American anti-narcotics agencies. All U.S. assets in which Mwau held more than 50% shares were frozen. The U.S. Treasury Department believes Mwau used overseas tournaments and his status to start moving narcotics. In the same period, Mwau visited Colombia quite often: according to top sources, Mwau set up his links with drug traffickers at that time. The accusations thrown in the Parliament by former minister Saitoti were based on a joint investigation run by US law enforcement and Kenyan government. Strongest allegations moved the investigation at the beginning, less concrete in the later evidence. The confirmation is John Harun Mwau’s investigation: in February the “Interim report on drug trafficking investigations” by Kenyan police concluded: “No evidence has so far been found to link him to drug trafficking”. In 2012 the main accuser, professor George Saitoti, died in an helicopter crash on the outskirts of Nairobi: Al Shabaab militias and drug traffickers are the main suspects for the disaster. Investigations have not yet found anyone guilty. In 2011, the United States sanctioned Mwau under the Kingpin Act, and is currently working to seize $750m of his investments there. Adam Szubin, the Director of the Office of Foreign Assets Control (Ofac) in the US Department of Treasury, told journalists: „We view [Mwau] as among the more powerful and active narcotics traffickers in the region.“”It’s not a quick or short process. We built a case slowly and carefully to ensure that it is soundly built“. “The US never apologises for killing its enemies, real or imagined.” Mwau said in 2011. “They will violate other nations’ airspace and eliminate their targets. The task of justification is left to themselves“. Mwau also claimed that he had every reason to believe that the move by the US government to designate him as a significant foreign narcotics drug trafficker was tailored to make him an easy target for elimination. In January 2014, the National Authority for Campaign Against Alcohol and Drug Abuse in Kenya (NACADA), invited by John Harun Mwau to say whether they had any evidence linking him with the drug trade, cleared the former politician of any involvement in drug trafficking. But, as reported in the Daily Nation piece on the subject, “Nacada is a State agency and chairmen of such institutions do not have the powers to clear individuals of any past or present allegations“. A report issued in 2010 by the U.S. Embassy in Kenya and cited in Parliament by then Internal Security Minister George Saitoti says that MPs Joho, William Kabogo, John Harun Mwau, Gideon Mbuvi and Mombasa tycoon Ali Punjani, are among the most dangerous drug traffickers in the country. The document is also signed by then U.S. ambassador Michael Ranneberger. The report describes how Abubakar Joho and his brother Ali Hassan are in charge of a multi-million euro trafficking empire. Abubarak is the first one of the two to enter the drug trade. In the early ‘90s he begins working in a clearing and forwarding company and later finds a new position in the vehicles business. Once he finds out the owner of the company had died during the Rwanda genocide he decides to take over and starts diverting vehicles destined to Rwanda into the Kenyan market. But vehicles soon become less lucrative. His guts tell him to move on to more profitable business, the one flourishing in and around the port of Mombasa. Here he finds employment in a company that clears container from ships to the quay, and vice-versa. According to the U.S. report, Abubakar Joho „was the clearing agent for containers that held one ton of cocaine in 2004“. The influence of Abubakar on Ali Hassan is the one typical of an elder brother towards his younger. According to the American document, it was Abubakar who insisted and convinced Ali Hassan to enter politics. And so he does. A young Ali Hassan Joho runs and wins the 2007 elections as a representative of the Mombasa region in the national parliament. Shortly after, the report suggests, his career in the drug trade begins. The report reads that the political campaign that grants him the regional political seat was founded by Swaleh Kandereni, Billy Mahandi and Swaleh Ahmed who are all arrested in Mombasa under drug trafficking charges in 2010. According to the American document, Kandereni allegedly was a major supplier to dealers in the coastal town of Malindi. Another of Joho’s influencial campaigner „was suspected narcotics trafficker Ali Punjabi“, the report reads. It is since 2010 that the Kenyan Anti Narcotics Unit suspects Ali Hassan Joho to be involved in the narcotics trade. The report fails in providing more details on such claim. Due to Joho’s „political position and financial resources it is unclear what [Kenyan] police intended to do with evidence“, the report ends. Ali Hassan Joho is elected as governor of the Mombasa county on March 4, 2013. Together the brothers own Prima Bins & Pest Control, an import-export company in charge of waste management and rat- killing, based in Mama Ngina Drive, Mombasa. It is through their company that the pair move drugs across Kenya. U.S. officials also identify Israeli company Amiran Kenya Ltd, owned by Israeli businessman Andy, as a crucial actor in the criminal network. 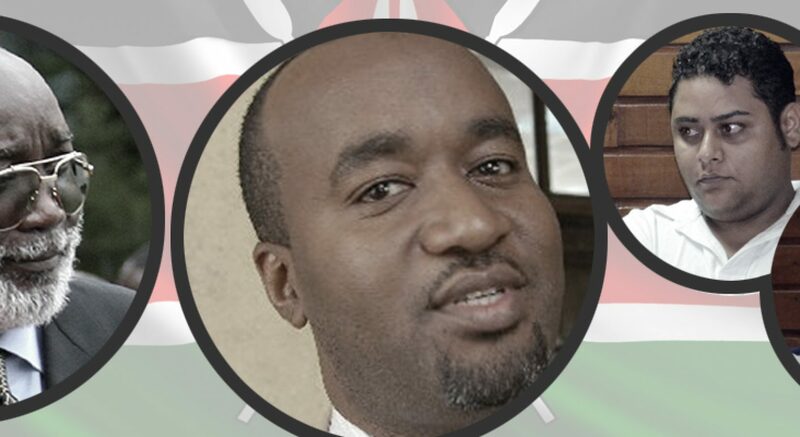 Andy appears closely connected with a Mombasa-based man, nicknamed Adamo, one of Joho’s trusted operators. 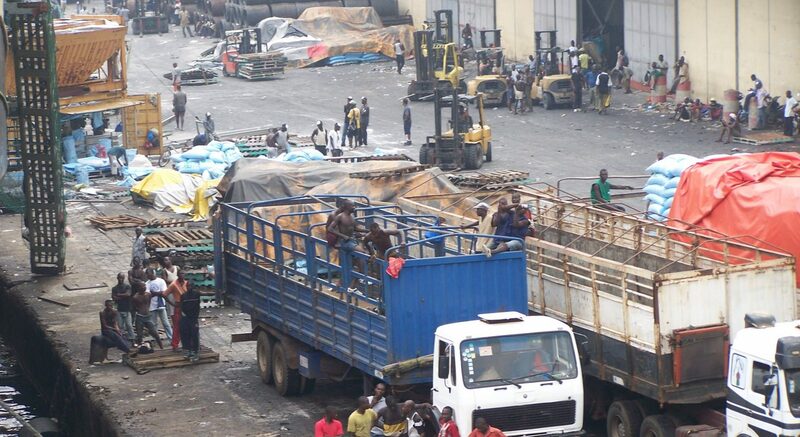 The American report insists that both Mwau and Johos have own companies based at the Kilindi port, in Mombasa, where the cargo seized in December 2004 was heading: “Some of the cocaine [from the 2004 haul] had been stored at the Pepe Container Freight Station CFS, a facility owned by Mr Harun Mwau”. Ali Hassan Joho also appears as a close acquaintance to Mary Wambui, activist and among the fiercest promoters of former president Kibaki’s political campaign. Wambui, after being Kibaki’s personal counsellor, took his parliamentary seat in 2013. According to the U.S. report, Wambui met often with Hassan and promoted his candidacy for a seat in the regional parliament of Kisauni in 2007. Sitting on the throne of drug barons in Kenya is the Akasha family. The world came to know their name when the forefather of the family Ibrahim Akasha brought to court in 1996, charged on drug trafficking. Ibrahim Akasha is a Swiss-based billionaire, the value of whose estate was estimated at USD 100 million, and who owns property in Amsterdam, the Middle East and Asia. Following Ibrahim’s reign, in 1998 it was his brother’s turn: the allegation was for a heroin possession worth USD 140.000. In his absentia, Ibrahim Akasha hired a Yugoslavian conduit to ship his consignment to Europe. This new agent was linked up to an international syndicate based in Amsterdam: at the top of the Dutch gang was Sam Klepper, a notorious drug trafficker born in the Netherlands. Akasha’s inside men in Amsterdam were the Barsoums brother, Mounir and Magdi. For a couple of years the new collaboration between the Dutch and the Kenyan gangs ran smoothly. The equilibrium cracked in 1999 when the payment for a drug consignment failed: the event sparkled an internal feud then ended when the Akasha abducted the Dutch gang’s Yugoslavian agent from which they managed to cash in USD 211.000. Sam Klepper had it in 2000, while Ibrahim Akasha was shot dead while walking hand-in-hand with his wife in Bloedstraat [Blood Street], Amsterdam. It is likely that Mounir Barsoum pulled the trigger. Some days before Ibrahima Akasha had received a phone call from Magdi Barsoum inviting him to Amsterdam. He had obtained the Dutch visa in Spring 2000, just in time to avoid to be caught by the police who found 4.7 tons of heroin worth Sh940 million in the up-market Nyali Estate, Mombasa, the Akasha’s home. Kenyan state was preparing to seize all the family assets. In the end, all the operation was a failure: they didn’t succeed in breaking the Akasha’s empire. For a feud that stopped, a new one started: this time Klepper’s gang was fighting against a Yugoslavian gang led by the famous drug dealer Streten „Jotcha“ Jocic which joined the syndicate. Yugoslavs pushed for executing Ibrahim Akashah. The feud kept leaving fresh blood on the turf: in October 2000 Keller was killed, followed by the Barsoums brothers in 2002 and 2004. Since the ‘90s, drug dealing has always been a trademark for Akashas. According to Kenyan intelligence, The Netherlands was the final destination of the huge haul of 1,2 tons of cocaine cargo seized in 2004. They suspected that the Akashas were the men behind it. The US Drug Enforcement Agency „had spent years infiltrating Akasha and alleges that the gang is part of a heroin supply chain that stretches from the poppy fields of Afghanistan through east Africa to the cities of Europe and the United States“, wrote Drazen Jorgic in a Special report by Reuters. „In documents filed in a court in the Southern District of New York on November 10th, 2015, the U.S. prosecutors alleged that the Akasha organisation was responsible for the „production and distribution“ of large quantities of narcotics in Kenya, Africa and beyond“, continues the report. Baktash Akasha Abdallah — considered by intelligence sources as the new boss. 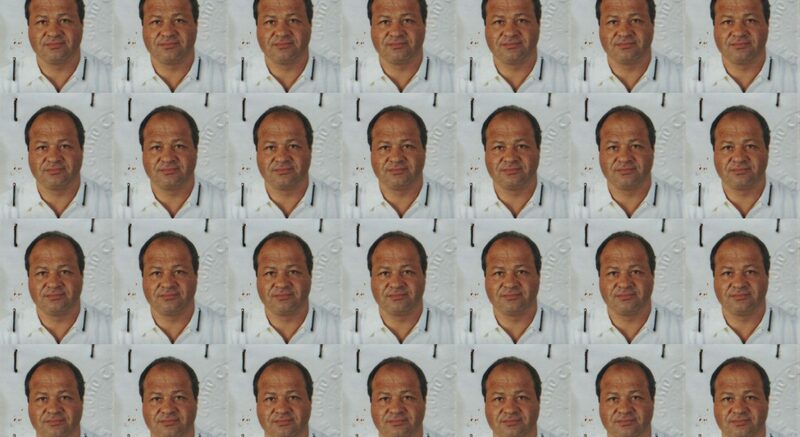 In November 2014, the U.S. government requested the extradition of Baktash Akasha Abdallah, Ibrahim Akasha Abdallah because of what the DEA stated about their trafficking, delivered to The US. In a report, Baktash is described as the leader of an organised crime and drug trafficking network and his bother Ibrahim, a chief lieutenant in Baktash’s alleged drug trafficking activities. Four suspected top drug traffickers in Kenya awaiting extradition to the United States were freed on bail Monday, amid concerns of east Africa’s growing importance as a smuggling hub. In March 2015 Baktash paid a 30 million shillings (USD 325.000) bail to be freed. According to US court documents and to Akashas’ lawyer, the DEA sting started in March last year. “Do you honestly know anyone who has never evaded taxes?” asks Mario Mele, Italian businessman and fugitive, from a table at the busy Pata Pata Cafe in Malindi, Kenya. Mele is the cafe’s renowned manager and, from dawn to sunset, available chairs are rare in his joint. A Premier League football game plays of the cafe’s TV, but Mele ignores it. As customers flow into the Pata Pata Cafe, he manages to greet them with a quick smile, before returning to the videocamera with a worried expression. Mele flew to Kenya in early 2012 where he started doing what he does best. 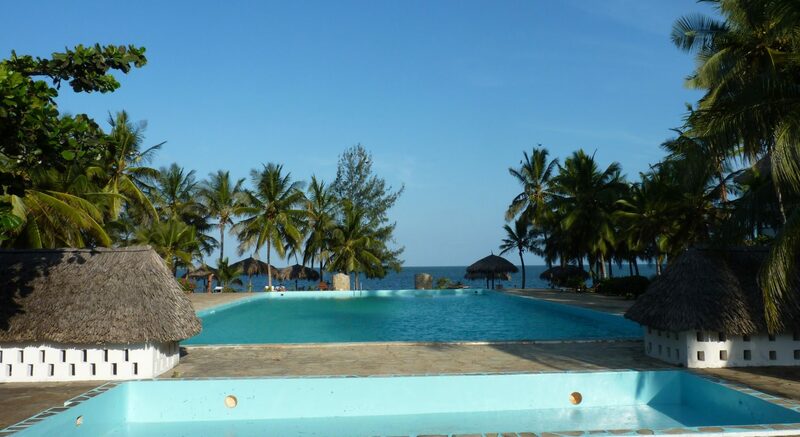 He opened the Pata Pata, a welcoming cafe in the city center of Malindi, a tiny outpost for Italian tourists and businessmen on the south coast of Kenya. 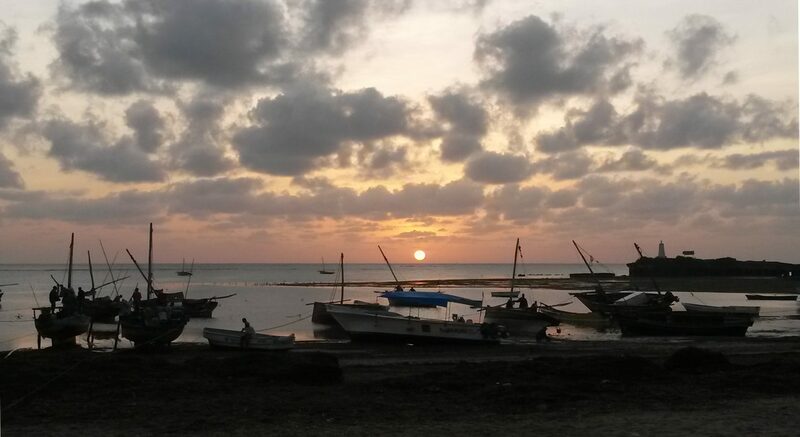 Malindi is a strange town for Kenya. Italian is its second language caused by the incredible numbers of expats who, since the 1970s, have moved here, looking for a fresh start or to invest in the tourism industry. Other come to just spend the winter in warmer climes, often with the company of a local, young girl. The Pata Pata disco club (today Wip the club) in Agrustos, Italy. But Mele is no ordinary expat. In his native land, the Gallura region of Sardinia, which itself welcomes thousands of Italian and foreign tourists every summer, there is a trial awaiting him. He is charged with fraudulent bankruptcy for 17 millions euros. It is a high fall from grace for this entrepreneur, a man who owned many of Sardinia’s premier night-spots, which provided expensive champagne and exclusivity to Italy’s wealthy VIPs. “I have no intention to go back“, Mele tells IRPI reporters. Andrea Schirra, a magistrate in the prosecutor office of Nuoro, led a year-long investigation into the bankrupcies of companies owned by Mele and his associates, Gian Pietro Porcheddu and Ivan Deidda. Mele’s companies — RISEA and EDO — went bankrupt in 2011. „We believe they were all bankrupted intentionally, in this way it was easier to make all the profits disappear“, said police officer Alberto Cambedda to La Nuova Sardegna newspaper in 2012. Mele is now at large in Kenya. He refused to answer magistrate Schirra’s questions, but he did agree to answer IRPI’s. What brings reporters to the table at Pata Pata, however, is something only partially touched on by the Fiscal Guard’s investigation. During the fiscal check on companies owned by Mele and his business partners, police found a trace leading straight to a mafia clan from Sicily, the D’Agosta. The Sicilian Mafia, also known as Cosa Nostra, is a criminal organization originating in Sicily, Italy. It is made up of criminal groups engaging in a wide range of illegal activities, from racketeering to drug trafficking. They share a common code of conduct and often count on local, national and even international support at a political level to evade justice. In 1989, Salvatore Incardona was a small entrepreneur in Vittoria, a tiny city in the south-east corner of Sicily. He owned a stall in the local market, and everyone in town knew his name. He was well-liked, but different. The other stall-owners in the food and vegetables market paid protection money to the local mafia clan, the powerful family of Carbonaro. But Cardona refusedto pay the pizzo [extortion]. He wanted his business to run clean without filling mafia’s pockets, and invited his colleagues unite with him and do the same. That sort of disobedience the Mafia cannot let pass. at 5:45am on the morning of June 9, a hit squad waited outside his house. As Cardona got in his car to leave for work, men unload in his directions, riddling his body and vehicle with bullets. He left behind a wife and a 25 years old son. A few years later, the city of Vittoria and the surrounding province of Ragusa (see image) see the rise of a new mafia clan, the D’Agosta, led by Francesco D’Agosta. Francesco is the father of five children, a renown local politician with crucial connections with the underworld and local public officials. Above all he is a man with dark ambitions. He sets up his own crime syndicate and, after a period of fruitful collaboration with the clan of the Carbonaro, he decides to change sides and to challenge the powerful clan for the control of the Ragusa territory. Local media report years of killings and of bloodshed streets. The feud is on and it leaves countless bodies behind. Operation „Mammasantissima“ — a slang word that mafia members use to call a boss – puts an end to the war in May 1998 when police arrest 28 people, most of which belonging to the D’Agosta clan, including the five sons of Francesco. It is the end of the D’Agosta clan. A few months later, in September 1998, a street in the city of Vittoria is named after Salvatore Incardona, nine years after his murder. With the operation „Mammasantissima“ the names of twin brothers Gianfranco and Carmelo D’Agosta begin to appear on police reports with increasing frequency. To the extent that a few years later, Gianfranco is sentenced for the crimes of mafia association and drug trafficking. The war lost against the clan of Carbonaro must have been a good enough reason for D’Agosta’s offsprings to leave Sicily for good and to export their illegal activities in other regions of Italy. The D’Agosta clan has always operated in Sicily and Milan, were the clan laundered money in posh pubs. Bars and cafes were a special D’Agostas interest too. In July 2012, judge from the Milan Law Court Anna Maria Zamagni gave the go ahead for the seizure of the Samarani Cafe, a classy bar in the luxurious center of Milan, formerly owned by the mother of the two brothers. The judge believed she was a simple proxy. 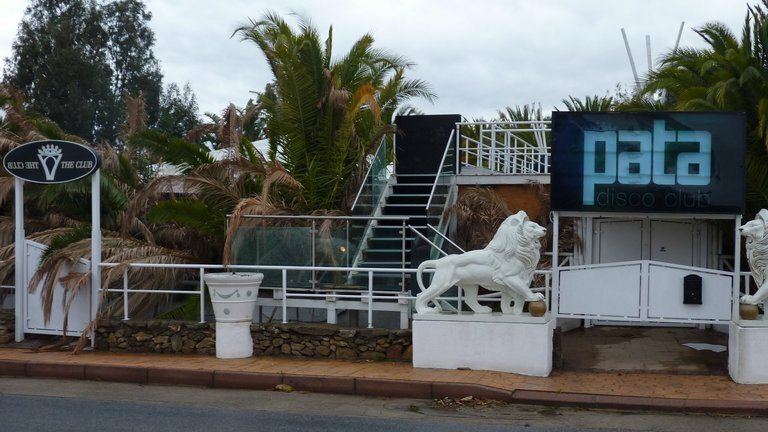 The same measure was also taken against the Babilonia Cafe and Il Faro di Molarotto, respectively a bar and a hotel located in Olbia, Sardinia. The entire seizure totalled € 5 million in assets. The criminal records and the individual income tax returns of the D’Agostas, believed to be too low to afford managing bars and hotels — raised sufficient suspicion for the Italian anti-mafia police to freeze their properties. During the investigation police found a copy of an € 80.000 check at D’Agosta’s house, issued to I AM DIAMOND Srl by the Lugano (Switzerland) branch of UBS bank. With thousands owed, I AM DIAMOND legal representative, Simone Cavallo, called Gianfranco D’Agosta to help him collect the credits, according to Cavallo’s testimony to investigators. By scrutinizing thousands of company documents, investigators believe that the only company entitled to issue a check to I AM DIAMOND was RISEA, therefore Mele. “Ridiculous is the statement [by Simone Cavallo, ed.] according to which Gianfranco D’Agosta would have acted as mediator for I AM DIAMOND in order to collect the credit due by RISEA, as [D’Agosta, ed.] declared he barely knew the legal representative [of I AM DIAMOND, ed.]“. In order and to understand whether Mele and his associate Porcheddu own any assets or bank account in Switzerland, the prosecutors issued a „request for information“ to Italy’s neighbouring country. The outcome is still pending. “I have met D’Agosta once, maybe twice,” Mele says in response to journalists’ questions. “I barely knew him.“ Italy’s fiscal police suggests that D’Agosta, Mele and Porcheddu might have formed a criminal association for the management of nightclubs in Sardinia. According to police records, champagne was not the only reason why these questionable parties came together. Besides the recovery of the € 80.000 check found at Gianfranco D’Agosta’s house, police say the two had a common interest in a club called Le Burlesque, where strippers and cross-dressers regularly take the stage to entertain patrons. According to prosecutors, the directors of the club’s management company were previously employed by RISEA Srl and Il FARO DI MOLAROTTO, owned by Mele and D’Agosta, respectively. And there is more. A 2012 police report claims that Mele purchased audio and video equipment through RISEA for installation at Le Burlesque. „It is likely that the club [Le Burlesque] is managed by Mele and D’Agosta through the use of proxy figures“, the police report states. As admitted by the prosecutor office of Nuoro, the investigation on Mele was focused strictly on the huge tax evasion. A confidential source in the Nuoro fiscal police told us that their main interest was the dubious and fictitious movement of payments within the network of companies led by Mele and his associate Porcheddu. Sardinia, Milan, Sicily, Kenya and Switzerland. A line connects these dots, but the details remain unclear, hidden behind financial secrecy. The „request for information“ letter sent by the prosecutor office to Switzerland’s Minister of Justice may yet illuminate many dark corners. The Swiss Bank knows the real issuer and receiver behind that 80.000 € check. According to the prosecutors, it is likely that all the bankruptcies of Mele’s and Porcheddu’s companies aimed to evade creditors in a safe bank account far from the Italian Revenue. Doubtless, the prosecutors asked the Swiss for the answers to such questions. And so the prosecutor’s office can only hope for cooperation. But the chances of success are low. While prosecutors await an answer from Switzerland to untangle the mystery, Mele stays safe in Kenya as the trial against him and his former associates starts at the end of April 2015. His new customers seem happy and plentiful. One can only wonder if the Kenyan revenue service is receiving from Mele the full taxes that he owes from his new venture in Africa. Vito Roberto Palazzolo, aka Robert Von Palace Kolbatshenko, currently sits in Milan’s Opera Prison, condemned to a nine-year sentence for ‘Mafia association’ after evading Italian justice for nearly three decades. Organised crime experts regard Palazzolo as one of the most intelligent and powerful Cosa Nostra’s members of recent times — and as one of the mafia’s bankers during the ‘Pizza Connection’ era, when heroin money was laundered through US pizza joints. But few are aware of the broader picture. And even fewer know the exact features of his own vast empire. Palazzolo is a modern Midas: all that he touches turns to gold. Between 1976 to 2012 he fostered an empire without borders. Starting in Germany, he quickly moved on to Switzerland, and then South Africa, passing unseen through the world’s tax havens. Today, from his cell, he can only dream of his marvellous African properties, the penthouse on the Victoria & Albert Waterfront, and villas in Bantry Bay in Cape Town, and the splendours provided by the profits from the diamond mines of Angola, Russia and Namibia. Palazzolo was undoubtedly a savvy businessman and an invaluable ‘service provider’. Throughout his career Palazzolo provided the Cosa Nostra with complex money laundering schemes, profitable investments and a safe haven for fugitives; he facilitated joint diamond ventures for the corrupt oligarchy of South Africa, Angola and Namibia; and opened the gates of the Sub-Sahara for Italian industrialists. But just how big is Palazzolo’s empire? And who manages this now that he is behind bars? 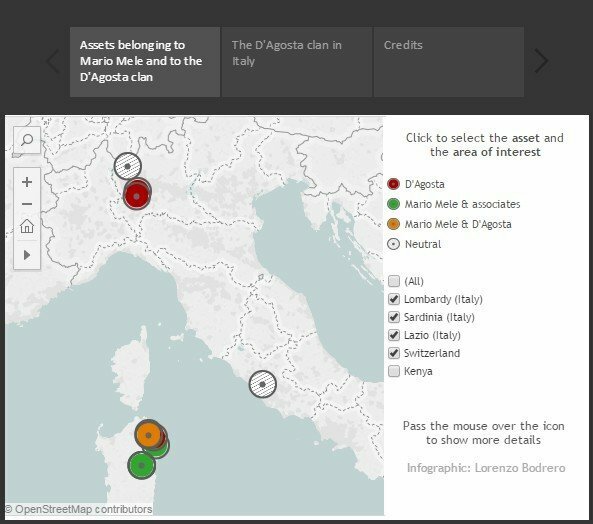 A joint investigation by non-profit investigative reporting centres, IRPI, Italy, ANCIR, South Africa and CORRECTIV, Germany, with the collaboration of data analysts from Quattrogatti, UK, reveals the extent of Palazzolo’s assets, deals, networks and influence. Palazzolo’s relationship with justice is long and troubled. For years, Italian law enforcement investigated Palazzolo for mafia activities without a conviction. In 1992, a court in Rome dismissed all pending mafia-related prosecutions and charges against him. The 2006 Palermo verdict is based only on Palazzolo’s activities after 1992. Although the pre-1992 evidence is inadmissible, the Palermo verdict claims Palazzolo was close to a number of the crime bosses of the Sicilian Cosa Nostra since the end of the 70s. Figures like Pasquale Cuntrera, Pasquale Caruana, Antonino Rotolo, the Bono brothers, Nenè Geraci and the big man, Totò Riina. Born in 1947 in Terrasini, Palermo, Vito Palazzolo migrated to Aarau, Switzerland in 1962. Two years later, at the age of 17, he returned to Italy, to Rome, where he began training as a simultaneous translator. A smart young man, he picked up languages quickly and by the time he took a job on a tourist ship as „head chef“ he was already mastering English, French and German. During one cruise on the Rhine Palazzolo met a German woman, Margareta Petersen, who would become his wife. On 27 January 1966 she gave birth to his first son, Christian, with Peter following a year later. In April 1967, at the age of twenty, he was back in Germany, in Hamburg, employed at the Deutsche Bank and making good money. In less than a year, he saved DM120,000, left his job and began working as a private banker. By 1974, Palazzolo was in Switzerland, where he became acquainted with Myriana Konopliz the daughter of the ’emerald king’ Konoplitz, gemmologist and owner of Konopliz S.A. Palazzolo’s brother, Pietro Efisio, was already working for Knopoliz in Antwerp as a gemmologist and diamond classifier. Konoplitz introduced Palazzolo to the precious stones trade, which at the time had already been infiltrated by Antonio Madonia, Cosa Nostra boss in Palermo. It is not clear when exactly Palazzolo was made a „man of honour“ under the mafia „mandamento“ (a commission ruling on at least three contiguous mafia families) of Partinico, but by 1974 he was a mafioso, operating in Germany and Switzerland under the supervision of Madonia. By 1975 Palazzolo was in fact working with two German companies: Zoltan Zucker, based in Pforzheim and Christel Biersack Import Export, based in Constanta. Antonio Madonia was an agent for the company Zoltan Zucker and a director for the company Christel Biersack. Each outfit moved diamonds and gold in great quantities until they closed down in the 90s. Through Myriana Konopliz, Palazzolo started Pageko A.G. in Zurich, and obtained his licence as a precious stones wholesaler. As the company increased its capital, Palazzolo opened a German branch and established property investments in the States. The 18-month long Pizza Connection Trial of 1985 was the biggest international investigation into the operations of the Italian mafia. In the Summer of 1981 Palazzolo came into contact with Finagest S.A., a financial consulting firm from Lugano — and, in particular, its manager Franco Della Torre. Together they opened a Treuhandgesellschafft company, similar to a trust, called Consultfin. Palazzolo said that Consultfin was set up to provide banking services for a select clientele passed on from Credit Swiss, and for trading in precious stones in partnership with Zoltan Zucker. But Consultfin’s premium service was money-laundering. It is unclear whether Consulfin was set up with that in mind, or simply adapted to its clients’ needs, but soon it was doing business with the Cosa Nostra. As heroin moved east from the poppy fields of Turkey into the arms of American drug addicts, at least $1.6 billion in illicit funds flowed back to the bosses in Sicily, $40 million of which went through Consulfin and other companies set up by Della Torre and Palazzolo. With the arrests of dozens of underworld operators in 1984, Palazzolo soon became a wanted man, sought by police forces in the U.S., Italy and Switzerland. The charge was „mafia-type association“ and „having directly or as an intermediary financed the illegal trafficking of narcotics“. The Swiss authorities arrested him that same year. The Americans proposed immunity in exchange for turning state’s witness. In June 1985, Palermo’s Judge Giovanni Falcone, who was brutally murdered by the mafia in 1992, issued a warrant for Palazzolo’s arrest, but the banker was not handed over to the Italians. Instead, on 26 September 1985 a Swiss court sentenced him to three years in jail for violating narcotics laws by money laundering. Palazzolo’s defence is that he was not required by Swiss law to investigate the nature of the funds, saying „the edifice of Swiss banking was built on discretion and secrecy“ and that the funds where linked to the narcotics trafficking in the US „unbeknown to me“. On 24 December 1986, using a 36 hours Christmas pass, Palazzolo’s escaped to South Africa. As a banker in Germany and Switzerland he conducted much business with South Africans looking to sidestep international sanctions by using the underworld to move money. For much of Palazzolo’s life on the run, South Africa was a haven. By the time Palazzolo arrived in South Africa in the winter of 1986, the country had already provided refuge to two important figures in his life: his brother, Pietro Efisio, and the Sicilian coffee manufacturer, Salvatore Morettino, head of Eurafrica Imports and Exports (Pty) Ltd. In 1995, the Servizio Centrale Operativo (S.C.O) of the Italian Police grew concerned that the Morettino group was involved in money laundering. South African Police shared this concern, believing that 8 million rand per month was being funnelled through the companies, by receiving foreign exchange from Italy, the USA, Germany, Switzerland, the UK and Mozambique, country where he had „suspicious“ timber operations. The South African police discovered in 1989 that Morettino’s Eurafrica Imports and Exports had received R 650.000 from one of the banks of Pizza Connection, the Union Bank of Switzerland. According to joint Italian and South African police investigations, in 1996 Morettino was responsible for hiding the mafia fugitive Mariano Tullio Troia, a brutal assassin for the Cosa Nostra. Attempts to arrest Troia in South Africa failed, due corruption in the local police force. Troia left South Africa unmolested, and was eventually arrested in Palermo two years later. Morettino was never convicted on mafia allegations. Prosecutors in Palermo dismissed the charges against him. He could not be reached for comment. The Italian S.C.O also believed there was a handful of Italians involved in the Cosa Nostra chapter of Cape Town, headed by Palazzolo. Palazzolo was involved in some of the top nightclubs in Cape Town, including the Hemingway Club, and another company called A Table at Colin’s, established in 1994. The latter connects an array of individuals, including Palazzolo’s two sons and Serbian criminal Goran Bojovic, wanted by Interpol for a “series of murders in the mid 90s,” five of which were conducted from Cape Town — where authorities believe he is still hiding. Palazzolo’s sons, and the Kolbatschenko family in general, could not be reached for comment. The Italian connection to Palazzolo in South Africa was just a base to start from, surely not the lever to his growth. This role that was covered by some crucial South African figures. Palazzolo wasn’t just a fugitive. He knew the secrets to banking, using the offshore, and trading precious stones. He knew how to play the queen on the chessboard, while slowing growing into a king, and at the same fostering larger reigns, those of South African friends. Palazzolo’s first sanctuary was Ciskei, a small independent state in the Eastern Cape, later annexed by South Africa in 1994. Palazzolo arrived when the country was still in the grip of Apartheid, and quickly befriended members the white ruling class and the reigning National Party. According to the Italian verdict, Peet De Pontes, a National Party MP, assisted Palazzolo in obtaining a residence permit. De Pontes also introduced Palazzolo to the long-serving Foreign Affairs Minister, Roelof Frederik “Pik” Botha. With Botha it was an immediate meeting of minds. In 1995, Botha allegedly helped Palazzolo obtain South African citizenship, despite the fugitive’s appearance on Interpol’s most-wanted list. Botha would later deny this. By 1995, Palazzolo was going by the name Robert Von Palace Kolbatschenko. He married his second wife, Israeli/South African citizen, Tirtza Grunfeld, daughter of Eugene Grunfeld, an important diamond dealer with reported links to the Mossad. The Palace Kolbatschenko family moved to La Terra De Luc, a large farm in Franschhoek. The farm was the perfect place to play host to the likes of Botha and other members of South Africa’s establishment. In the 1970s and 1980s, Pik Botha was at the epicentre of all mineral, military and trade-related activities in the region, which directly affected the past and present „war“ eras in Africa. During Botha’s tenure as Foreign Minister, the SA Defence Force (SADF) was a veritable „diamond mining company“ conducting covert military and mineral deals. According to a top intelligence source, in the 1980s, Botha allegedly connected Palazzolo to SADF military intelligence operatives. This could not be corroborated by a second source. The SADF allegedly approached Palazzolo to set up a casino for money laundering and sanctions busting in Namibia, using a nominee lawyer called Anton Lubowski. But as the venture came into effect, Palazzolo was captured by police acting under a Swiss arrest warrant and sent back to Switzerland to finish his jail sentence. At the request of Palazzolo’s attorney Cyril Prisman, Lubowski visited Palazzolo in jail in Lugano during the summer of 1989. Back in South Africa, Lubowski expressed his discomfort over the nature of the meeting, telling his trusted secretary that he was not prepared “to do all that these people wanted from him”. One month later Lubowski was murdered by the South African Civil Co-operation Bureau (CCB), a secret Military Intelligence death squad eventually exposed by the Inquest Court under (ret) Judge Harold Levy in 1993. Palazzolo would also be connected to a diamond company, Trans Hex later to be chaired by Tokyo Sexwale, one of South Africa’s leading black businessmen. Sexwale was a known political activist and anti-Apartheid campaigner. In 1998, he entered the diamond trade. Trans Hex, a leading diamond player competing with mega entities such as De Beers, would come to hold valuable concessions along the west coast of South Africa, where the most valuable marine diamond mines on the African continent are located. In 2001 Trans Hex obtained prospecting rights in mining concessions owned by Palazzolo in Angola. When Palazzolo was sentenced by the Swiss Court back in 1985, he cried poverty, claiming he was so broke he could not even support his family. Italian court documents show that Palazzolo began purchasing assets and property in 1987, immediately after his arrival in the country. And when the South African police raided Franschhoekshhoek, they found thousands of dollars in diamonds and weapons. Property deeds obtained by IRPI show that Palazzolo purchased his farm in the Cape Winelands district in 1983, confirming his connection to South Africa during the „Pizza Connection“ times. According to the state-witness Leoluca Bagarella, Palazzolo likely managed an important Cosa Nostra asset in South Africa for capo dei capi, (head of the mafia) Bernardo Provenzano: an as-yet-unidentified diamond mine. By the early 90s Palazzolo owned farms in Plettenberg Bay and Franschhoek, as well as a luxury home in Bantry Bay, Cape Town. But the real scope of his ownership goes beyond what is in his own name. 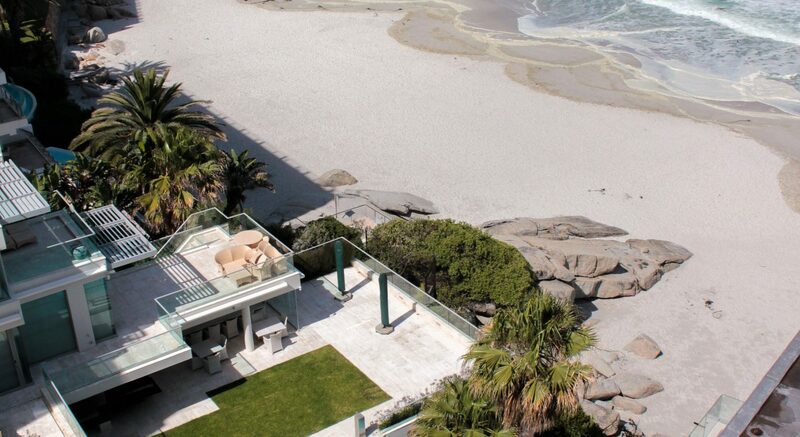 Between 1993 and 2006 his extended family, sons Christian and Peter, brother Pietro Efisio, wife Tirtza and father-in-law Eugene, acquired numerous properties in the most stunning locations of Cape Town, like Bantry Bay, Shortmarket and the Waterfront — now a stone’s throw from the Cape Town Stadium, built to host the 2010 World Cup. 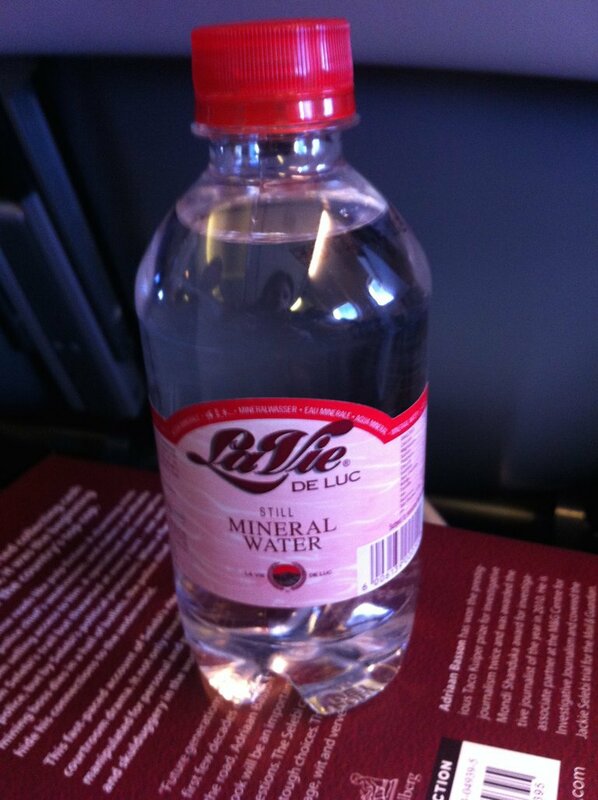 Palazzolo also set up a water bottling plant at his Franschhoek farm — La Vie de Luc — that supplies numerous African airlines, including South African Airways. In Namibia Palazzolo acquired numerous farms in different parts of the country, accounting for a total of 34.000 hectares and over N$24 million (about US$ 2 million). From 2006 he decided to move to Windhoek, the capital of Namibia, scared South Africa might decide and extradite him. There, he acquired a villa in the exclusive neighborhood of Klein Windhoek where he lived until the day of his arrest. A calculus of all the properties that could be traced by IRPI/ANCIR as having passed through Palazzolo’s hands in South Africa and Namibia shows that he has owned and mainly still owns via nominees or family members $41 million worth of properties. How many cops Palazzolo owned? In 1995 and 1996, joint Italian and South African forces were pursuing mafia fugitive Mariano Tullio Troia. In June of ’96, South African police raided Palazzolo’s La Terra de Luc farm hoping to find Troia. He was not there, but police did find traces that two other mafia fugitives, Giovanni Bonomo and Giuseppe Gelardi, had been there. Mandela, then South African president for two years, requested a special unit to investigate the extent of Italian mafia presence in the country. The Presidential Investigative Task Unit (P.I.T.U.) was created, and Mandela appointed police agent Andre Lincoln to its head. Evidence of Palazzolo relationship with policemen in South Africa shows the extent of his buying power and influence. When the P.I.T.U. started investigating Palazzolo’s networks, agents discovered he allegedly had on, or connected to, his payroll a number of current and ex-cops, including powerful general, Neels Venter, head of the police unit investigating organised crime — and whose daughter and son-in- law were employed at a Palazzolo’s farm in Namibia. Another unresolved matter is Palazzolo’s relationship with the U.S. Federal Bureau of Investigation (FBI): Although Palazzolo was on their most wanted list, they allegedly used him as an inside informer in Angola. There are also unresolved questions over Lincoln himself. „Operation Intrigue“ tasked the cop with penetrating Palazzolo’s networks. Lincoln went undercover, befriending the banker and following him to Angola. While there, he discovered that Palazzolo owned several diamond concessions, operated and run in close association, allegedly, with Eduardo Dos Santos, President of Angola. When Lincoln returned from this trip, trouble started. He filed a report to the then Deputy President, Thabo Mbeki, warning that he was encountering significant opposition to his work from the South African police. Shortly after, he was arrested for corruption, theft and fraud. The allegations seemed bogus, and largely based on accusations made by Leonard Knipe, Western Cape’s violent crimes chief. Knipe had collected a statement by Palazzolo claiming Lincoln failed to repay the cost of the trip to Angola. Palazzolo also claimed he used his contacts to introduce Lincoln to the inner circles of the Dos Santos clan, rulers of the country. Knipe admitted on the record that he held animosity towards Lincoln and that he was largely responsible for his arrest. Lincoln was later cleared of any impropriety and re-admitted to the police. In 2009, the appeal judgement clearing Lincoln established that though evidence against him ran to more than 5000 pages, the entire trial “consisted of intrigue, name dropping and very little else…“. The judgement included the names of several high-ranking officers alongside political figures, such as President Mandela and President Mbeki. Until that time, Lincoln, a former bodyguard to Mandela, had been tipped as the next Chief of Police. In 2002, it was discovered Knipe was providing private security to Palazzo’s Franschhoek Farm. Knipe, Lincoln and Venter could not be reached for comment. Maybe not from Franschhoek. But Palazzolo made great use of the offshore financial world to run his entrepreneurial activities. In Cape Town, he opened the Von Palace Kolbatschenko Trust, listing members of his family, including his father-in-law, as its trustees. In 1999, the South African police requested assistance from Liechtenstein. According to preliminary investigations, Palazzolo was using the country’s financial system to launder cash in connection with a „criminal organization and illegal acts in narcotics law“, since 1986. Palazzolo would, allegedly, set up phoney loan agreements using companies managed by nominees, such as staunch ally Swiss lawyer Mario Molo, or using his family trust, the Von Palace Kolbatschenko Trust. Through cession, a change of creditors would be arranged and, via a shrewd scheme to conceal the true origin of the funds, the money circled back to the control of Palazzolo. Liechtenstein’s authorities believed a loan emitted by Vaduz based company, Corlis AG, and South African company, Spanta Development, to be a suspicious case, which shows how millions in US dollars and South African rands entered Liechtenstein via the Boland Bank, a bank close to Palazzolo’s luxury farm in Franschhoek. Another method used the Liechtenstein company called Round Timber & Timber Products Establishment, to move money from the Von Palace Kolbatschenko Trust to Round Timber, via a US-American bank and back into Trust itself. On 7 September 2001 the High Court of South Africa ruled that the National Director of Public Prosecutions should cease its prosecution of Palazzolo, including on money laundering charges, and was barred from prosecuting him again on the same facts. It also ruled that the Public Prosecutor withdraw all requests for mutual legal assistance to Lichtenstein and Switzerland and to return all bank statements and documents obtained during the course of its investigation. “In line with the High Court decision, I objects the companies mentioned by you [n.d.r. Corlis and Round Timber] have been used for illicit aims“, IRPI’s Swiss attorney, Mario Molo, said. Molo is the same attorney who defended Palazzolo’s during the Swiss 1989 ‘Pizza connection’ trial. However, the 2006 Palermo conviction delivers the definitive verdict on all Palazzolo’s illicit activities. This Court confident pronounced that Palazzolo never stopped laundering money for the Cosa Nostra. This was confirmed by state-witnesses, mafia „pentiti“, activities that took place after 1992. The year is important because Palazzolo in 1992 was cleared of mafia association charges by a Court of Rome, and the Palermo verdict condemns him only on mafia related crimes post 1992. Investigations of South African police into alleged money laundering were stopped by the High Court ruling of 2001, but the Fiscal Guard of Palermo is still digging to find out where the real empire of Palazzolo lays. One certainty exists, and it is seems quite likely that Palazzolo did make extensive use of the offshore world, mostly to secretively control mining activities in Africa and beyond. It is through the offshore world, specifically three BVI-incorporated companies, Cape International Holdings Ltd, Peregrine Finance Holdings Ltd and Ayres International Ltd that Palazzolo’s acquired six mining concession in Angola starting from 1995. Leaked documents obtained by ANCIR show more. Although it is not possible to reconstruct the first steps of Palazzolo into Angola, it is possible to assert with certainty that in 1995 he already established a solid base in Luanda, partnering up with two controversial individuals. The first is the Italian Roberto Mattei-Santarelli, allegedly a rough diamond smuggler, arrested in Namibia in 1991 for receiving stolen goods, and again in 1994, when he was stopped by authorities in Rome airport in possession of an „unjustified“ quantity of precious stones, worth about one billion lire (€500 million). The second is Leonard Stephen Phelps, a Jewish South African banker who achieved notoriety for his unscrupulous conduct as a director of the failed Cape Investment Bank. Palazzolo cannot travel to Luanda on a regular basis. Instead he used Mattei Santarelli and Phelps as his representatives. But Palazzolo needed more than these two foreign partners to penetrate the riches contained within Angola’s mines. Leonard Stephen Phelps passed away in 2010, Mattei Santarelli did not reply to our request for comment. Angola is a country whose recent history is blighted by conflict. After gaining independence from Portuguese colonialism in 1975, it fell into a devastating civil war which lasted, on-and-off, until 2002. It is world’s fourth largest diamond producer by value, a legacy of few blessings. The 1980s and 90s saw two sides warring for control: on one side stood major global diamond companies, associated with the Angolan government’s most prominent individuals, and the other the ‘National Union for the Total Independence of Angola’ (UNITA), and attacked mines and sold them on the black market to pay for the war. By 1992, UNITA had captured most of the productive mining sites in Angola, and it was only after the Lusaka peace agreement of 1994 that companies started investing again. Palazzolo was among them, and one of the few who had the courage to invest in Angola’s Lusaka North diamond industry (De Beers failed any attempt). The mafia kingpin knew the key to success in Angola was to establish companies and bring in the creme-de-la-creme of the government. And that is what he did. In Diagema he placed General Jose Joao Mawa Mawa, the man in charge of security for the Angolan President’s. In Somicoa and Gema Dourada he placed two other key players in the State security service: General Mau Mau and General Joaquim Antonio Lopes Farrusco. When he established Kupolo, he joined with President Eduardo Dos Santos and handful of ministers, including Vice-Minister of Defense, Julio Mateus Paulo. The bella-vita-style had to be ensured. With Kupolo, Palazzolo first opened The Tropical, a hotel & casino in Luanda, which later obtained mining concessions in Lunda North province, an area with the highest concentration of quality diamonds in the country. Many other companies followed, and each inaugurated homonymous mines. Almost immediately, Palazzolo turned over part of the concessions’ rights to his BVI company, Ayres international. Only his Angolan company Gema Dourada was treated differently. He passed 50% of the rights to another of his BVI companies, Peregrine, which covered all mining costs. Palazzolo then transferred the Gema Dourada shares into Cape International in the BVI, in anticipation of the arrival on the scene of a new foreign actor. On March 1996, shares in Cape International were sold to the Australian giant of oil and mining, Longreach Gold Oil Ltd, represented by Boris Ganke. The transaction was for at least US$9.8m, according to leaked documents obtained by ANCIR. South African police investigators claim that Longreach is the financer of Palazzolo’s mining in Angola, and not a simple „buyer“ of concessions. According to data IRPI/ANCIR could analyse, which are partial and come from leaked documents, Gema Dourada was a deposit of approximately one million carats worth about $200 million. In 1998 Longreach invited a new partner in the venture: Trans Hex — a company later connected to Tokyo Sexwale, who was allegedly one of the first politicians and entrepreneurs Palazzolo befriended when he arrived South Africa in 1986. Trans Hex agreed to fund 75% of the costs of exploring the uncharted blocks of mines owned by Kopolo, Somicoa and Diagema, which were worth about $80 million. A paper on the mineral industry of Angola by George J. Coakley claims Trans Hex consultants „found and inferred resource on two of the concessions at 400,000 carats of gem quality diamond in the $200 per carat range.“ In lay-speak: some of the best diamonds in the world. Longreach oil and Trans Hex did not reply to request for comment. Undoubtedly, one of Palazzolo’s most fruitful friendships has been with Israeli diamond businessman, Gershom Ben Tovim. A resident of South Africa, Ben-Tovim inexplicably obtained in 1993 one of the most exclusive marine diamond concessions on the Namibian coast, then under licence by De Beers. How the two became acquainted is not known, but in the early summer of 1995, Palazzolo welcomed Ben Tovim into his main Namibian venture: Nacoco Ostrich Farm. 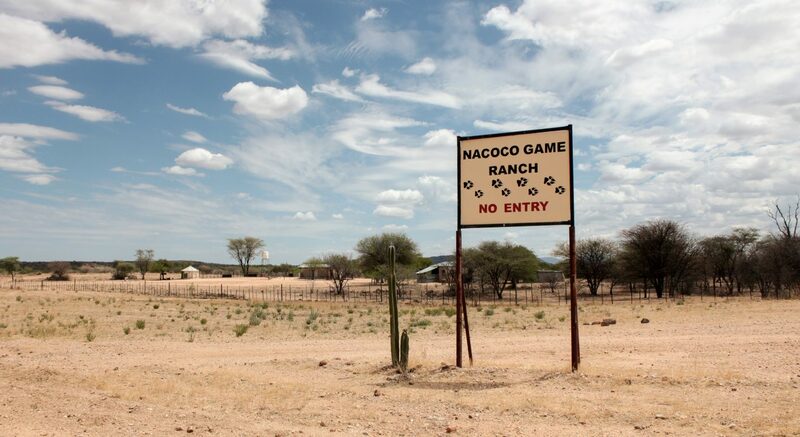 Located in the Omburu-Sud farm in the central district of Omaruru, about 200 km from Windhoek, Nacoco was an exclusive game reserve housing 10.000 ostriches, an exotic attraction for Namibia’s rich and powerful. Perhaps it was the scorching temperatures of the Namibian bush that inspired Palazzollo and Ben-Tovim to seek deals in the cold climes of Russia. But when Ben Tovim asked for his help orchestrating the “deal of century”, Palazzolo was more than willing. The proposed venture was to obtain concessions in Russia’s Lomonosov diamond mine, the largest of Europe, situated in the north-west on the Gulf of Finland. For this, Ben-Tovim needed a loan. Palazzolo provided it. He used his Liechtenstein-based Corlis A.G, a company that had been investigated for „money laundering“ in a case that was later dismissed. Ben-Tovim soon found another partner for the project: Australian state-owned mining giant, Asthon Mining. Palazzolo opened a BVI company, Fourth Investments Sa, especially for the occasion. Through Forth Investments, Corlis and Ashton paid for US$2.3 for 17% shares in the Russian company AO Severalmaz, which held the rights to the Lomonosov diamond mine. At a meeting between the Australian and the Russians at Palazzolo’s luxurious Roodfontein Stud Farm in Plettenberg Bay, a South African based consortium was established. 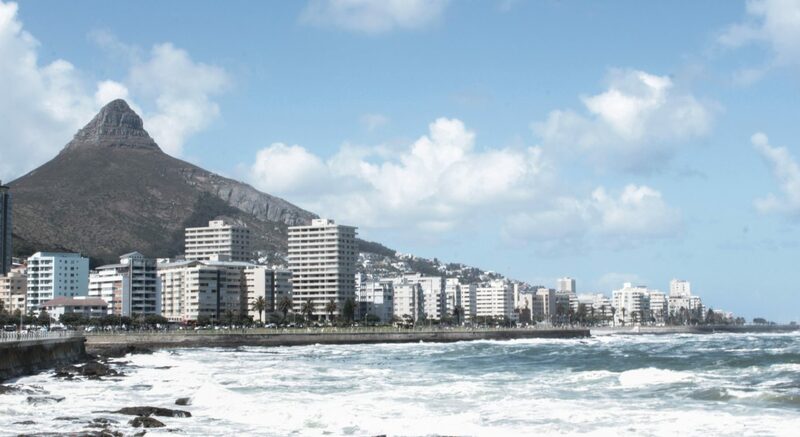 Diamonds could now be marketed to the world via Cape Town. How much money Palazzolo made from this deal is not known, but Lomonosov deposit has an estimated value of $12 billion. In 1997 De Beers was starting to show interest for the mine, and it is feasible Fourth Investment and the other Russian partners passed the concession to the giant mining company, considering in 2000 De Beers passed it to Alrosa, a Russian public company which controls Lomonosov today. Ashton mining, a partner of Palazzolo in Fourth Investment, is now part of the Australian mining giant Rio Tinto, which did not reply to our request for comment. Gershom Ben-Tovim could not be reached. In 1990, after serving his remaining sentence in Switzerland for the Pizza Connection charges, Palazzolo was free to leave the country. But in South Africa, where his family and assets were, he was now a persona non grata. So, instead, he entered Namibia on a fake Uruguayan passport and obtained residency. It was likely during this period in Namibia that Palazzolo first shook hands with a controversial man from Calabria, Italy: Saverio Polera. From September to July 1991, with Palazzolo in Namibia, Polera was put in charge of the La Terra de Luc farm in Franschhoek, before he could head back to South Africa in 1992. Saverio Polera is largely unknown in Italy, but his alleged diamond smuggling activities are well-documented in Zambia and Namibia. Polera, born in 1942, moved to South Africa in 1962, becoming an important figure in the diamonds trades of Zambia and Lesotho, where he is reported as very close to the Royal Family. Polera could not be reached for comment. According to a research by Namibian reporters, Polera is, along with Palazzolo, an associated with Sandrose’s Safari. When reporters visited the offices of the Namibia Company Registry in Windhoek to obtain copies of Sandrose’s Safari company documents the files were “missing” — stolen, according to an employee. „It happens sometimes here in Namibia“, they added. According to the Namibian reporters, another associate of Sandrose’s Safari was Vito Bigione. Bigione previously owned a restaurant on the beach of Swakopmunt, Walvis Bay. The La Marina Resort, opened in 1999, was an old, converted oil train, and Italians who tasted his spaghetti attest that it was the best in Namibia. But Bigione was not your normal pasta maker. 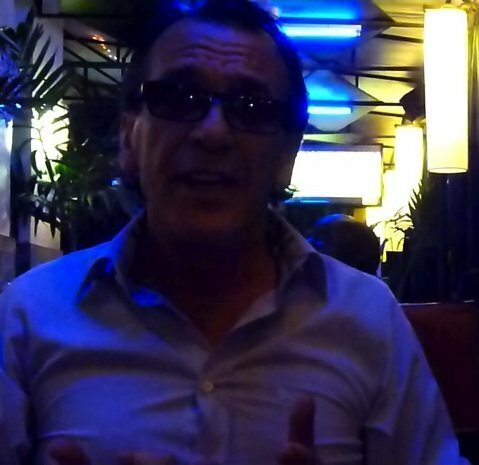 He was in fact a Cosa Nostra member known as „the accountant.“ And he managed cocaine trafficking from Colombia into Italy, via Swakopmunt, using the La Marina as a cover. “Before that [Namibia]“, says Prosecutor Nico Horn, who investigated Bigione, „he was in Cameroon“. Bigione’s move to Namibia might have been facilitated by the presence of another important Cosa Nostra fugitive, Giovanni Bonomo, who fled to the country in 1996. Bonomo was capo mandamento (Commission Boss) of Partinico, the same mandamento of the Corelone mafia under which Palazzolo was associated as a „man of honour“. Bonomo had escaped Italian justice just in time. Entering South Africa he was immediately hidden by Palazzolo at La Terra de Luc and then smuggled into Namibia, where he stayed for a while on another of Palazzolo’s farms. Bonomo spent several years in Namibia, later moving around Africa until he was apprehended in Senegal in 2003. Exactly what he got up to in Namibia is a mystery, but his authority over Bigione suggests the possibility that he kept a close eye on the smuggling operation. Bigione was arrested a year after Bonomo, in Caracas. During his stay in Namibia, authorities refused to hand him over to the Italians: In Namibia „mafia association“ is not a crime. Palazzolo was never asked to comment on Bigione. He did admit hosting Bonomo and Gelardi. But he maintained he did so before any charges were brought against the mafia mobsters, claiming „This is disproved both in documentation and more specifically because precautionary measures (ergo, that they were subject to criminal proceedings) were imposed on them only on 29th May, that is, subsequent to their departure from South Africa, which took place on the 21 May 1996“. Palazzolo’s claim was rejected by the 2006’s Palermo verdict which maintained that Bonomo and Gelardi passed into Namibia before that. Again Palazzolo dodges by saying, „restrictive measures are a far cry from a confirmation of their guilt. All citizens are, after all, innocent until an irrevocable conviction is passed against them.“ The Palermo verdict that condemned Palazzolo for mafia activity was also based on his contacts with Bonomo and Gelardi. The summer of 1999 was an important time for the Cosa Nostra in Africa. Vito Bigione was opening La Marina Resort CC in Namibia and shipping boats full of cocaine, generating huge profits and making fine spaghetti. Palazzolo’s interests was also shifting into the transport industry, having been given the go ahead for a new African airline. Confidential documents from high level sources, obtained by ANCIR, reveals that the end of the 90s, if not before, Palazzolo was allegedly in close connection with a large mining company called Demindex. Demindex was founded in October 1996 by Pik Botha, who in that time was minister of Energy and Mineral Affairs under the ANC-led Government of National Unity. He was also allegedly a good mate of Palazzolo. Another key partner to Demindex is Rika Lourens, one of Palazzolo’s pupils. And it is precisely Ms. Lourens whom, on a fax to Von Palace Kolbatschenko date 23 June 1999, tells him that Demindex Resources Corp has been listed on the Vancouver stock exchange. She adds „the aviation licences have been granted to African Star Airways with 7 flights per week, JNB/LND and JNB/MUC“, meaning the plane will leave Johannesburg heading London and Munich. Ms.Lourens continues: „they“ require US$150 million for this project, which is open to all kind of investors. In another fax dated 20 August 1999 Ms. Lourens informs Von Palace Kolbatschenko that „prior to start up African Star Airways“ they „contracted cooperative agreements“ with Virgin Atlantic for the terminal maintenance in London and Lufthansa in Munich for heavy maintenance. But African Star Airways actually never took off: its only plane, a Boeing 747-300, was bought by the African Star Airways from Singapore airlines in 1999, and after only one year it was sold to UT Finance Corporation, a subsidiary of the US based multinational conglomerate and military contractor United Technologies Corporation. Both Munich’s Airport Authorities and London Gatwick Airport authorities confirm the plane never hit ground. It appears the whole African Star Airways remained a ‘paper airline’ that never started to work. Whether this was planned for some money laundering reasons or whether it was just a failing project is hard to tell. Joseph Kirama, former CEO of African Star Airways, on December 1999 was in trouble with the South African Revenue Service, for a 7 million rand tax evasion, while his employees allegedly were left without salary since August 1999. For an airline company that only got its license in June 1999 there was a surprising lack of financial planning. Ms. Lourens could not be reached for comment. 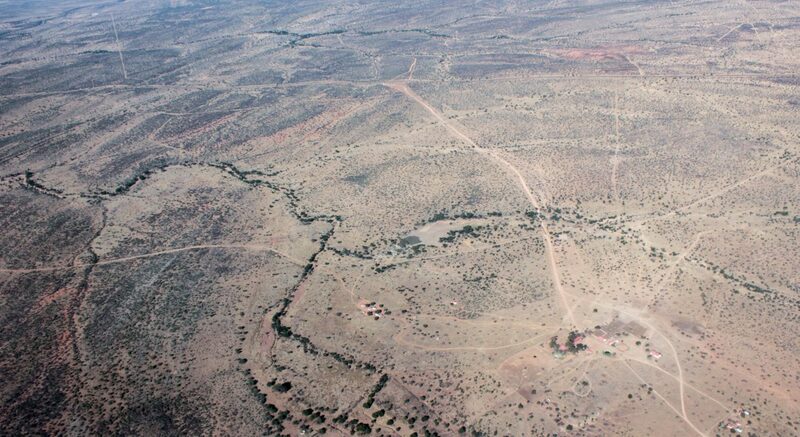 Palazzolo in Namibia had interests that stretched well beyond Omburu-Sud ostrich farm. One distinguished business partner is none other than Zacharius ‘Zacky’ Nujoma, the youngest son of Namibia’s first ever president, Sam Nujoma. Nujoma Sr was the leader of the South West Africa People’s Organization (SWAPO) that fought against South African rule. Zacky, 57, studied Geology in Germany and became an active player in Namibia’s rich mining sector, particularly diamonds and uranium. Palazzolo and Nujoma have partnered up on several occasions. But Namibian sources say the association is less than equitable, and that Zacky serves as frontman to Palazzolo’s business: Palazzolo provides the cash, and Zacky, the ‘Nujoma’ name. In Namibia, the diamond trade is regulated by Namdeb Diamond Corporation, a joint venture between the state and diamond giant, De Beers, which until 2007 managed exclusively the country’s mining sites. After 2007, a subsidiary was created to supply rough diamonds to selected sight-holders. This change was widely criticised as a means to deter the Namibian elite from breaking De Beers monopoly over an important national resource. Presently, there are 11 authorised sight-holders — with the Namibian ruling class part of this exclusive circle. Zacky Nujoma is among them: his company, Nu Diamond Manufacturing, is a subsidiary of Crossworks Manufacturing — one of the 11 sight-holders. But Palazzolo’s has his hand in Nu Diamond, too. And there is a loan that proves it. On 10 October 2011, Mannheim Investments, owned by Palazzolo and his family members, provided a US$2.8 million secured loan to Nu Diamond. With this loan Nu Diamond opened its cutting works. As part to the agreement, Nu Diamond is to keep US$2.1 million worth of diamonds on its premises. Evidence of a professional alliance between Zacky and Vito Roberto go further back. In 2005 Zacky Nujoma acquired two off-the-shelf companies, Avila Investments and Marbella investments, from Christian Gouws, Palazzolo’s favourite nominee lawyer from who he bought most of his off-the-shelves companies. As soon as Avila and Marbella obtained licenses to buy and cut diamonds in Namibia, 90% of the shared capital was transferred to an offshore company, Diamond Ocean Enterprises Limited, registered in the British Virgin Islands (BVI). Due to secrecy laws in the BVI, the true ownership of the company is unclear, but there is a significant connection to Palazzolo. One of Avila’s directors is Von Palace Kolbatschenko Peter, registered at Apartment 7, 38 Shortmarket Street, Cape Town, the same location of Pietro Efisio, Palazzolo’s diamond cutting shop. Pietro is Peter Kolbatschenko’s uncle and Vito Palazzolo’s brother. A year after purchasing Avila and Marbella companies, in 2006, Zacky established Ancash Investments (Pty) Ltd as a Black Economic Empowerment (BEE) initiative — a positive discrimination programme designed to reverse the economic inequality of Apartheid racism by putting resources into the hands of previously disenfranchised citizens. Almost immediately Ancash obtained at least seven Uranium Exclusive Prospecting Licenses (EPL) from the Ministry of Mines and Energy. Then in September 2006, Palazzolo advanced Ancash US$10 million in “financial assistance” from his Hong Kong-based Mega Diamonds Development Ltd to support “exploration” of the mines. Shortly after the Palazzolo loan, Canadian uranium exploration and development company, Forsys Metals Corp, announced its intention to “partner” with Ancash’s on its Uranium mining contracts. But in February 2007, instead of purchasing 70% of Ancash directly, Forsys instead bought 100% shares in Mega Diamonds, and with it 70% of Ancash’s mining rights. Over the years, Palazzolo maintained strategic contacts with the Italian power centres, mainly through his Sicilian-based sister, Sara Motisi. In 1996, Sara attempted to use connections as the sister of a kingpin to get her husband, Vito Motisi, nominated as a candidate in Forza Italia, Silvio Berlusconi’s party. Some years later, Palazzolo asked Sara to return the favour. In 2003, Sara and Vito Roberto were trying to find ways to influence investigations, including the one which later landed him to jail. The two brothers decided that Forza Italia party senator, Marcello Dell’Utri, was the right person for the job. In a phone-call to Sara, Palazzolo claimed Dell’Utri was „already converted“ [to mafia n.d.r. ], and could be of assistance. Through Dell’Utri, Palazzolo was granted indirect access to a group of lobbyists, politicians and industrialists — people who could influence Italy’s public policies. In exchange, Palazzolo promised brokerage services and to grease the wheels for a group of Italian investors, waiting to descend on Angola. According to an intercepted phone call between intermediates, Dell’Utri hoped to „3000 Italian industrialists“ to Angola. Prosecutors in Palermo say that during this time the Berlusconi government regarded the current Italian diplomats as „incapable“, and were looking for alternative ways conduct foreign diplomacy. There are suggestions, which we could not officially verify, that government decided, unofficially, to rely on brokers to help Italian industrialists get a foothold in Angola. According to Italian prosecutors, Palazzolo, regarded as a „finance advisor“ to Angola’s leadership, was a key man. In 2004, the first delegation to Angola was organised, but prosecutors failed to reconstruct events, since Angolan authorities were uncooperative. Then, in 2009, the government organised a further delegation of entrepreneurs to Angola, headed by the then Vice Minister to Economic Development, Adolfo Urso. The meeting was attended by Finmeccanica’s managers in Africa (Finmeccanica is the leading industrial group in the high-technology sector in Italy and one of the main global players in aerospace, defence and security) and managers from helicopter manufacturer subsidiary Agusta Westland. Two Finmeccanica executives who attended that meeting in Angola later told prosecutors in Naples and Palermo that Vito Roberto Palazzolo was present. None of the two had any idea who Palazzolo really was, figuring out only later. Adolfo Urso, the Vice Minister, claimed that Palazzolo was there without him knowing or noticing. When dealing with Sub-Saharan Africa, Mr.Fava would use as a base the Agusta Westland office in Pretoria, headed by one Patrick Chabrat. It was Chabrat, Mr. Fava would have told his colleagues, who introduced Palazzolo to him as a „great agent who made the fortune of Agusta in Sub-Saharan Africa“. Mr. Fava did not respond to request for comment. When the two Finmeccanica’s managers reported this encounter to Italian authorities they found themselves in serious trouble. The first manager, Finmeccanica’s representative for Sub-Saharan Africa, was removed from his position. Patrick Chabrat was promoted in his place. The second manager was allegedly threatened by Chabrat, who reported to prosecutors being told he would “need a nice protection program“, according to witness statement provided to prosecutors. But why does a company as large as Agusta need the brokerage services of someone with Palazzolo’s reputation? Before the merging with Westland in 2000, Agusta Spa was close to the company’s founding family — and Count Riccardo Agusta in particular. Count Agusta and Palazzolo are good friends. Since the 80s, they have managed land together in South Africa. Riccardo Agusta began buying property in the renowned vineyards district of Franschhoek in 1990. His first purchase was La Grand Provence, adding the adjoining vineyard and winery of Haute Provence in 1997. Palazzolo was now the Count’s neighbour, occupying the La Terra de Luc estate right next door. In 1999, Riccardo acquired shares in La Terra de Luc, and Palazzolo’s Roodfontein Stud Farm in Plettenberg Bay. In 2000, Agusta Westland appointed Patrick Chabrat as manager head for Sub- Saharan Africa. Chabrat moved to an office in Pretoria. In 2001, Agusta signed a lucrative deal with South Africa, selling 30 helicopters to the country’s Air Force for a price of R 1.9 billion. But the deal became part of South Africa’s biggest political scandal. Known as the “Arms Deal”, the Department of Defence was accused of receiving over one billion rands in bribes for contractors, according to British and German investigations. Agusta was named. An agent for Agusta’s biggest competitor, U.S. company, Bell, reported how he was “asked” to hire a local company to lobby for contracts on Bell’s behalf. The company was ‘Futuristic Business Solutions (FBS), secretly owned by General Lambert Moloi. Moloi was close to Joe Modise, the Defence Minister signing the deals, and Shabir Shaik, brother of Shamim Shaik, who headed the national defence department’s acquisitions and procurement division. Bell refused the conditions. But Agusta had different ideas, and agreed to pay FBS, and a connected company, African Defence Systems (ADS), „large success fees” once contracts were granted to Agusta“. Chabrat is under investigation from Prosecutors in Palermo for openly discussing how “black funds” were funnelled offshore to African ministers. Palazzolo, who allegedly made Agusta Westland’s fortune in Sub Saharan Africa, was never interviewed on whether he played a role in the arms deal. Finmeccanica was asked to comment on whether Palazzolo or Riccardo Agusta had a role in the ‘Arms Deal’, and to comment on the 2001 deal in general. The company said it „had not received any court record highlighting an involvement of the company and thus Finmeccanica will not comment on the issue“. Palazzolo to unveil the most obscure state secrets? Although 2009 appears to be the pinnacle of Vito Roberto Palazzolo’s career as a broker, 2012 saw his return to mafia fugitive status. While returning from a trip to Hong Kong, Palazzolo was captured in Bangkok airport. Finally in handcuffs, Palazzolo said he was ready to be interrogated on all „facts until 1984“. In exchange, Palazzolo wanted softer jail time. And for good reason. Italy’s organised crime figures are often subjected to harsh Article 41-bis conditions, which suspends prisoners’ rights, such as gifts and contact from outside. In a 23rd October 2012 letter from Thailand, Palazzolo claimed that the court’s conclusions were based on inferences, and evidence “not strong enough to constitute the circumstantial threshold necessary to justify a penalty of nine years detention for mafia“. He then asked to be heard as extradited trials “in absentia are not reliable and not applied Common Law countries“. In early conversations with prosecutors, Palazzolo was a willing witness. But when the topic turned to Finmeccanica, he stayed silent, refusing to answer questions. One-and-a-half years under 41bis conditions changed his mind. At the end of 2014, Palazzolo decided to talk, although the content of his conversations with prosecutors is a secret. But there is one clue as to the potential direction of the conversations. The prosecutors now interviewing Palazzolo are also assigned to the „Trattativa-stato-mafia“ investigation. Trattativa-stato-mafia is the name of the alleged secret treaty between high-ranking Italian officials, deviant members of the secret services and the Cosa Nostra, orchestrated in the 1990s following the murders of judges Falcone and Borsellino. After years of denying allegations, Palazzolo may now be cooperating. And this could have uncertain, far-reaching consequences for the Mafia and the state in Italy and South Africa, two nations that simultaneously prosecuted and protected Palazzolo. Giovanni Falcone’s 1985 arrest warrant for Palazzolo remained in place until 2003, when it was set aside by Italian courts because it contravened the rules on ‘double jeopardy’. For the 18 years of the warrant, Palermo requested Palazzolo extradition nine times. South Africa refused each request. In 1995, prosecutors in Palermo started investigating the activities of Salvatore Morettino, Sicilian coffee magnate and close friend of Palazzolo, requesting legal assistance from Pretoria. That same year, judges in Palermo issued a fresh arrest warrant for Palazzolo, not only for mafia association and but also for aiding and abetting fugitives Giovanni Bonomo and Giuseppe Gelardi. After three years of legal wrangling, the Court of Palermo convicted Palazzolo in absentia for ” external participation”, sentencing him nine years in prison. A year later, the Appeal Court of Palermo convicted Palazzolo again, this time for the crime of association with the mafia, a charge confirmed by the High Court of Rome in 2009. Palazzolo stayed fugitive until he was caught in Thailand on March 2012. Update 18 April 2019: We have deleted a part of the story’s section on Namibia in order to remove the reference to an Italian business Palazzolo was in touch with. Our project ‘Mafias in Africa’ has unearthed an unprecendented amount of information regarding Italian organized crime’s influence in African economies. Most probably, what has been uncovered is just the tip of the iceberg. Yet, the tip is huge enough to allow at least a very partial estimation of the value of the largest empire, that of Vito Roberto Palazzolo, a.k.a. Robert Von Palace Kolbatshenko, currently detained in Milan for Mafia association, after having escaped justice for well over a decade. As thoroughly exposed by the project’s investigation, from 1986 onwards Palazzolo has been building a vast entrepreneurial empire that touched South Africa, Namibia and Angola, with long arms that have reached presumably Russia and the Far East. With only incomplete and poor data in hand, Quattrogatti and Irpi have been trying to partially estimate the value of some of the entreprenurial adventures presumably involving Palazzolo throughout the years. The results are numbers that, despite their deep uncertainty, urge for the attention of policy makers, and call for radical reforms on how to collect information and combat globalised economic and financial crime. According to the investigation results, the economic net surrounding Palazzolo is composed of about 200 companies. This quantity accounts for all the companies in which Palazzolo, a member of his family, or a close associate as stated by prosecutors reports, acted or are active as board members. The net includes many companies which are no longer active, thus shedding light onto the history and dynamics of Palazzolo’s empire activities. Most of the companies are located in South Africa; information about companies in other countries, namely Angola, Namibia, Hong Kong and Lichtenstein, has been gathered too. Overall, most of the companies appear to act in five key sectors: construction, international trade, financial intermediation, agriculture, and mining. Knowing the exact number of companies involved in each sector has not been possible due to missing data. With a vast company net comes also a vast property portfolio. The project succeeded in identifying about 70 properties across South Africa and Namibia, which are owned or have been owned directly by Palazzolo, a family member or a company linked to the net. Preliminary calculations suggest that the minimum value of the property net amounts to about $41 million (see Methodological Note 1). The properties all reflect luxurious tastes: from highly expensive apartments located in Cape Town’s Bay Area to large villas in the South African winelands. With house and land prices expected to grow as economic growth drives South Africa and Namibia, these properties represent an extremely high-value, long-term investment. Palazzolo seems to have speculated in several mining activities in the 1990s. Along with high-profile political individuals in Angola, he set up a number of companies managing mining concessions of immense value. Gema Dourada’s diamond concession appears to feature an average of 0.55 carats per cubic meter, with an overall estimated value of $200 million. Feasibility studies indicate that three other Angolan diamond concessions – Diagema, Kupolu and Somicoa – contain a minimum of 400,000 carats, thus reaching an estimated value of $80 million. Until the late 1990s, Palazzolo is even linked to a 17% ownership of Severalmaz, the company dealing with the famous Lemonosov diamond deposit in Russia, whose total value reaches the astronomical amount of $12 billion. Apparently, the man did not dislike other precious resources, such as uranium. Investigations have linked him, together with Namibian Zacharius ‘Zacky’ Nujoma, to uranium mining rights then sold to the Forsys Metals Corp. Today, Namibian uranium mines owned by the latter company have an estimated value of $3.5 billion, with an economic analysis giving Forsys a pre-taxt net present value (NPV) of about $622.6 million. More information on where these numbers come from is provided in the Methodological Note 2. The project, in many ways, has been a success. Not only did it untangle the historical and current roots of the African economic empires of some important organized crime members, it has also documented their poisonous effects onto African societies. Criminal money corrupts and renders governments illegitimate. Mr. Palazzolo fuelled millions into the enterprises of Namibian first President’s son, Zacharius ‘Zacky’ Nujoma; placed former top political Angolan political figures – such as General Jose Joao Mawa Mawa, President Eduardo Dos Santos, Vice-Minister of Defense Julio Mateus Paulo – in the management of his diamond concessions. He also allegedly owned important chunks of South African police forces, namely Neels Venter, former head of anti-serious crime unit. Criminal money, when entering the legitimate economy and politics, distorts its functioning and makes it addicted to the illegal flow of money. Corruptible decision makers would align their interests with those of criminal entrepreneurs, thus discarding their responsibilities as public officers. At the end of the day, you end up in a country with a higher short-term GDP values, but with disastrous long-term consequences with respect to governance and economic equality. The money generated by a corrupted elite does not trickle down. It stays within the corrupted elite. The project has been, in many ways, also a failure. A good one, as it highlights several shortcomings that can only be addressed with concrete trasnational policy reforms. Integrating and better access to company data. Finding good quality company data is a tremendously difficult and expensive task when these companies are located in Africa. Data about cash flows (which would have been essential to estimate the economic value of Palazzolo’s economic network), for instance, has been impossible to attain. Both African and international parties should grant civil society the instruments to collect this type of information. That implies an open data policy based on the digitalisation and standardisation of company data across Africa and the world. Crashing the walls surrounding trusts. The picture on Palazzolo’s empire surfaced during the project is an incomplete one. Many facets appear to be hidden behind his offshore entity, the Von Palace Kolbatshenko Trust. Getting information on the Trust’s activities is a daunting task even for prosecutors. The example indeed serves as a further piece of evidence supporting international action for a more transparent regulation of offshore activities, and the need for access to Trust information when actors are involved in criminal activities. Asset confiscation in African countries. At the heart of the Mafias’ influence in Africa is money. Seizing the assets of those who have been proven guilty of organised and financial crime represents a huge step forward in dwarfing their economic power. Asset confiscation policies, though, appear to be poorly implemented, often non-existent. As in Europe, African countries ought to start devising a transnational anti-crime solution involving this measure. Data science must enter the stage. Data science – the use of statistical and machine learning methods to infer or predict patterns – can become the most important instrument for those who want to track and prevent criminal infiltration in the economy, both in Africa and abroad. After implementing efforts to ease access to company data, it is possible to develop models that monitor and predict the risk of a geographic area or an economic sector being infiltrate by organised crime. Such an approach would overturn the fight against Mafias by accelerating the tracking of their actions, or even predict it. 41 million is an estimation of the nominal value in current US dollars of the properties linked to Palazzolo that the investigation has found. By linked, it is meant properties currently owned or that have been owned by him, a close associate, or by a company to whom he is a director or a close associate. For each property, its purchase or sale value in local currency has been converted to US dollars using the respective historical exchange rate. An estimation of the likely current value of the properties has been calculated by adjusting their historical value by the change in the house price index of the respective country. The current value of Namibian properties has been estimated by leveraging on expert information. Readers should be aware of the tentative nature of the estimation: quantitative information about many properties is missing. We expect this value to change once more data is collected by future work. The average price of diamonds per carat in Angola has been set to $200 by the field experts consulted. As sources indicate Gema Dourada concessions to amount to 1 million carats, their estimated value is $200 million. 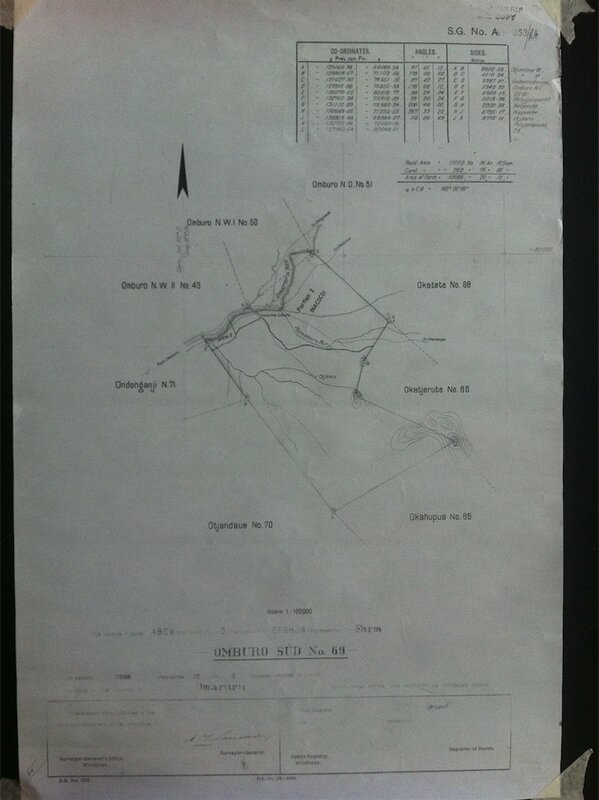 A paper on the mineral industry of Angola by George J. Coakley claims that at least two of the Diagema, Kupolu and Somicoa concessions amount to 400,000 carats. This value is taken as the minimum estimated one, with a consequent dollar value amounting to $80 million. 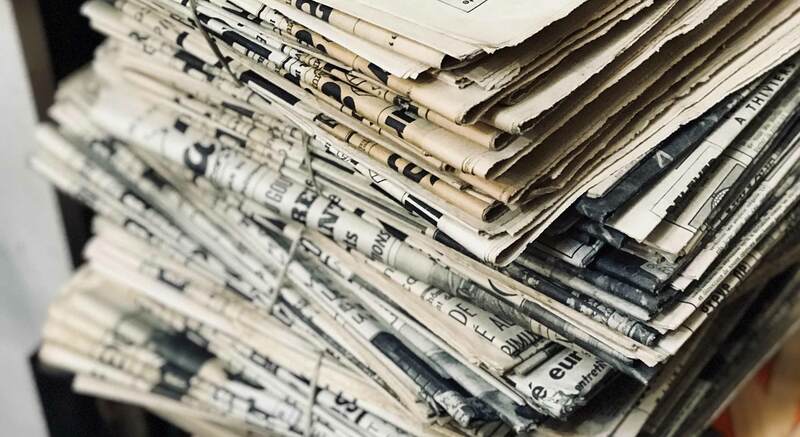 The $12 billion value of the Lemonosov deposit has been provided by Rough & Polished Ltd, a company specialised in news and analytics for the mining sector. The net present value of Forsys’s Namibian uranium concessions has been taken from the company’s website, together with the estimated lbs of uranium stored in the site, 90.7. The average uranium/lbs price ($39.25) at the time of the project has been used to calculate the deposit’s value. Because of the deep uncertainty and lack of data on the true amount of precious resources in the considered mines, these estimations have to be treated with caution. Novel data might yield better estimates. Nicola Assisi is one of the most important drug brokers of the Italian ‘Ndrangheta mafia group, in a trade worth over thirty billion euros. Having inherited the most precious contact book of the trade, Assisi has been sending tons of cocaine from South America to Europe. This is the story of how he and his sons have been playing cat and mouse with law enforcement for two decades. Caught in what seemed like a perfect trap, Rosario Grasso began to panic. Grasso, a member of the ‘Ndrangheta, one of the most powerful crime groups in the world, had come to collect 197 kilo of cocaine hidden between white bags in a container shipped to the Southern Italian port of Gioia Tauro. But inside the container, there was no trace of the drug, worth 20 million euros at street prices. Thoughts were racing through his mind. Did his own men steal it? Or had the sellers in Brazil dare to betray him, making him threaten and tie his own men to the ground in the middle of the night for no good reason? Grasso and his group had worked hard for a smooth shipment. They had bribed an official in the port, nicknamed Il Porco, to allow them access to remove the cocaine from the container. A picture of a small piece of wood appears on the screen of Grasso’s mobile phone, transmitted again by the broker who connected him to the sellers in Brazil. A container number is carved into the wood. 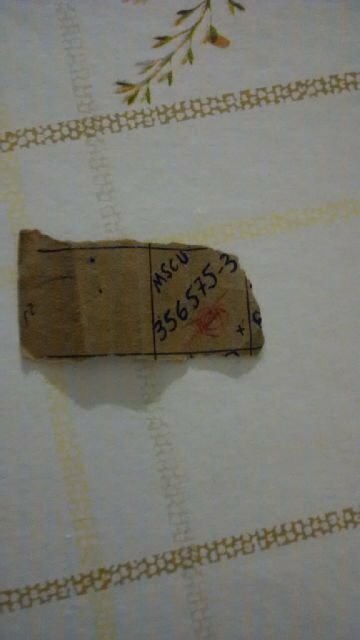 MSC U356 5753. Grasso looks up and checks the number of the container he is standing next to. MSC U356 5753. He has opened the correct container. The cocaine smugglers transmit messages using small pieces of wood. Grasso returns to the port one more time the next day to search the container bag by bag but there is no trace of cocaine. Cocaine trafficking is the primary source of the power of the ‘Ndrangheta. The mafia group, at home in the Southern Italian region of Calabria, is thought to control 40 percent of global cocaine shipments and is the main importer of cocaine into Europe. The group is laundering the proceeds, estimated by some at over 25 billion euros per year through their companies in the real economy. They are thought to use Germany and Switzerland in particular, two countries in which anti-money laundering and anti-mafia laws are lax. To shield themselves from prosecution, the ‘Ndrangheta bosses have set up a structure that separates the mafia hierarchy from the actual trafficking. Instead of exposing its own rank and file, the ‘Ndrangheta relies on dozens of brokers around the world. They speak multiple languages, work in white-collar jobs or travel through the Amazon jungle and climb the Andes mountain range to work directly with local drug cartels. One of the most powerful brokers is Nicola Assisi who has been slipping through police hands for more than two decades. Having inherited the most precious contact book of the trade, he and his sons are thought to be operating from the heart of crime in Latin America. The investigative journalism centers CORRECTIV and irpi.eu have investigated Assisi and his family based on court and corporate registry records as well as police interviews. This report reveals for the first time that the family has struck large deals with South American suppliers. Nicola Assisi first came to the attention of the Italian police as ‘the nephew’. Born in the southern Italian city of Grimaldi in 1958, little is known about his early life. There is nothing to suggest he ever attended university. In spring 1997, investigators were tracking a few Calabrian brokers in the Costa del Sol region, in southern Spain, who were trafficking cocaine from Barcelona to Turin and Rotterdam. Before dawn on 16 May 1997, police followed a man who had made a phone call to arrange a meeting with ‘the nephew’. The ‘nephew’ turned out to be Nicola Assisi and police followed them to a meeting point in the countryside north of Turin where a truck loaded with 200 kilogram of cocaine was waiting for them. “Finally we could put a face to Assisi. It was a breakthrough!“ says Abbate. A small number of police officers cornered Assisi who tried the impossible. „He ran towards the police car and tried to steal it by knocking down an officer“, says Abbate. Eventually the officers overcame Assisi and arrested him. It was the largest seizure of cocaine in the history of Turin up to date. At Gioia Tauro port, Rosario Grasso had been betrayed neither by his men nor the sellers in Brazil. The cocaine that he waited for in vain had been seized by police during transit in Spain. Police had refitted the container’s lock and allowed it to continue its route to Italy in an attempt to identify the smugglers. Rosario Grasso is seen next to the container at Gioia Tauro port. He sent this picture to Patrick Assisi, according to police. In the ensuing brawl between the ‘Ndrangheta buyers and their sellers in Brazil, Nicola Assisi steps in to restore order. He settles the dispute and points out this could have been a police trick. „I am getting everybody new phones, these ones are a bit consumed“, wire intercepts read. In fact, Italian police had managed to intercept and crack the encrypted Blackberry messenger system of the Assisi family and their partners, edging closer to the arrest of a man they have wanted since those days in Turin. As a first measure, Assisi’s son Patrick, who Grasso had been in touch via mobile phone while standing next to container number MSC U356 5753 at Gioia Tauro port, set up a trap himself to establish whether police were in fact tracking the traffickers. He sent an empty container with only a small load of cocaine to Gioia Tauro. But police let it pass in order not to compromise their surveillance. The key turning point in Assisi’s career had come in 2002. Fours years earlier, the glacial pace of the Italian justice system had allowed him to leave jail after just one year while awaiting trial after his arrest in Turin in 1997. He had yet not been indicted and a judge refused to renew his remand. Then, in 2002, Pasquale Marando disappeared. In his day, Marando had been the Ndrangheta’s most powerful drug broker. He had been the first to deal directly with the Colombian drug cartels in Latin America, cutting out middle-men and boosting his margins. Prior to this, the Costa del Sol in Spain was the middle ground where sellers from the Columbian drug cartels would sell to the ‘Ndrangheta. Marando had been a mentor to Nicola Assisi since the early 1990s and the disappearance was a severe blow. Marando’s body was never found. He was likely killed in a feud in 2002. But Assisi turned the loss of his mentor to his advantage. Investigators believe Assisi inherited the contacts of Marando’s most important drug suppliers in South America. Court records show that Assisi succeeded his mentor as a broker for two senior ‘Ndrangheta bosses in Turin who were linked to Marando’s family through marriages. Both were arrested last year after buying cocaine from Assisi. In 2007, ten years after Assisi’s arrest in Turin, the court was finally about to issue its verdict. Under Italian law, a person cannot be arrested twice for the same crime. “Exactly ten days before the final verdict sentencing Assisi to 14 years in jail, he escaped to the Costa del Sol and from there, we assume, to Latin America“, says Gianni Abbate, the police official who investigated Assisi in the ‘90s. Abbate’s Turin office is still filled with memorabilia of the old investigation. Another six years were to pass before the Assisi business would come to the attention of the Italian police once more. Prosecutors seek to arrest both brokers and the ‘Ndrangheta masterminds of cocaine deals. But the brokers do not consider themselves mafiosi. „When we caught and interrogated Assisi in 1997 he admitted selling drugs to the mafia, but if you would call him mafioso he would get really offended“, said Abbate. “Yet, do keep in mind the ‘Ndrangheta families respected him as a ‘man of honor’ „, he said using the term for a member of the mafia. For brokers, the ability to buy cocaine directly from local producers is key to their success, Nicola Gratteri, one of the top prosecutors in Italy’s fight against the mafia, told correctiv.org. He said the best of them manage to buy a kilo of cocaine for as little as 1,200 euros from cartels in South America. They can offer to sell a kilo for 30,000 euros to the ‘Ndrangheta. Clans who don’t have access to them need to buy from rival clans at higher prices. That means that the brokers who can buy directly from suppliers are the most sought after by the ‘Ndrangheta clans because they offer the best margins. Brokers such as the Assisis. On a cold winter day in January 2013, Patrick Assisi is walking over a mosaic portraying a huge medusa. It is the entrance to one of Turin’s best fish restaurants, at the spot where an icy alpine stream flows into the Po, Italy’s largest river. He wears sneakers, jeans and a coat, the trade-mark outfit of Turin’s youth. Patrick is greeted by representatives of some of the most powerful clans of the ‘Ndrangheta who are looking to buy from somebody directly in Brazil. Over fish, pizza and wine the men discuss the details of the deals. After the meal, the men walk out hugging each other. The deals are done. This was the first glimpse Italian police had of the Assisis again. Patrick and his brother Pasquale had entered the business. It was immediately clear to them that Patrick who unlike his father was not a wanted man in Italy, was acting as Nicola’s arm in Turin by closing deals with some of the most important figures in the ‘Ndrangheta, including from the Aquino-Coluccio clan. It was a successful meeting. The Assisi business had grown bigger than ever, shipping cocaine from Latin America in large quantities. Investigators believe that the Assisis buy cocaine from the most important Brazilian drug cartel, the Primer Comando Capital (PCC), and the Colombian Cartels based in Peru. The PCC are, along with Colombian and Mexican cartels, controlling the southern part of South America called Cono Sur, an area comprising the countries Argentina, Chile, Uruguay and Paraguay as well as the South of Brazil, an area local press has dubbed ‘Narcosur’. This is where Nicola and his sons, today both in their early 30s, are closing their deals. Court records show how they are bragging about cocaine bought in Peru, Paraguay and Brazil. Paraguay is increasingly turning into an important transit country for the cocaine destined for Europe. Small family clans are organizing the shipments, controlled by the PCC from Brazil. In Brazil, the Assisis are all but invisible. Communications with their Brazilian suppliers is done in a secure way. The sellers provide the Assisis with a piece of wood, into which the number of the container and the code for the container lock are carved. The Assisis then send this information through encrypted mobile phones to their contacts in Calabria. Following Patrick’s meeting in Turin, Italian police were at the heels of the Assisis again. The family declared no income, yet lived a luxury life, driving BMW X3s and renting a villa in Portugal for 10,000 euro per month. In fact, how to use the illicit drug money is a constant concern to drug traffickers. 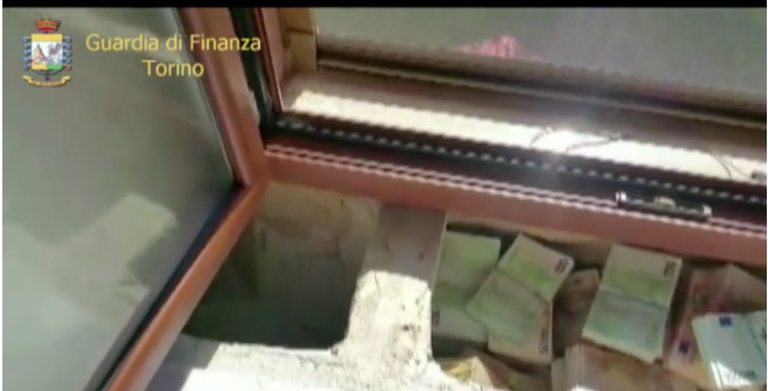 The drug ring led by the Assisis used couriers to send the proceeds to a gas station near Turin, where money couriers would pick it up and bring it to Brazil, hundreds of thousands of Euro at a time. Still, Assisi’s wife, who according to investigators is acting as the group’s cashier, once complained to her son Patrick that their house in Turin had no more space to stash away more money. When police raided the villa, they found four million Euros. No more space to stash away money in the Assisis’ villa in Turin. Much of the police work centers on breaking into the communications system of the traffickers. Italian police finally succeeded in spring 2014. By wire-tapping the phone of a close confidante of the Assisis in Italy, they were able to identify the group’s phones and the devices’ security pins. From then on, police dealt several blows to the traffickers, seizing half a ton of cocaine sent by the Assisis over four months that year. On 27 August 2014, Nicola Assisi is arrested for the second time in his life. Arriving from Brazil and using the fake Argentine identity of ‘Javier Varela’, customs officers at Lisbon airport were waiting for him. It is possible that Assisi had taken the risk to travel to Europe to lay the ground for a new way of shipping the cocaine. Police records show the group planned to use a Falcon 50 long-range private jet to fly the drugs to Europe, using the landing strip of a flight school in Germany. The drugs were then to be trucked to Italy. It is not known whether this plan was ever implemented. While the traffickers know no borders, the judicial cooperation within the European Union is patchy at best. After Assisi’s airport arrest, a court in Lisbon put him under house arrest. While Italian authorities scrambled to have the extradition approved by a local court, Assisi convinced the court to free him of his electronic ankle monitor and disappeared again. And in the end, the trap laid by Italian police at Gioia Tauro port backfired. It convinced the Assisis to switch to more reliable data encryption. Patrick bought Sony smartphones with an Android encrypted chat that until today has made it impossible for the Italian authorities to intercept the traffickers’ communications. CORRECTIV attempted to reach the Assisis as well as Rosario Grasso through their lawyers. None of them responded to the questions. Grasso is in jail awaiting trial. 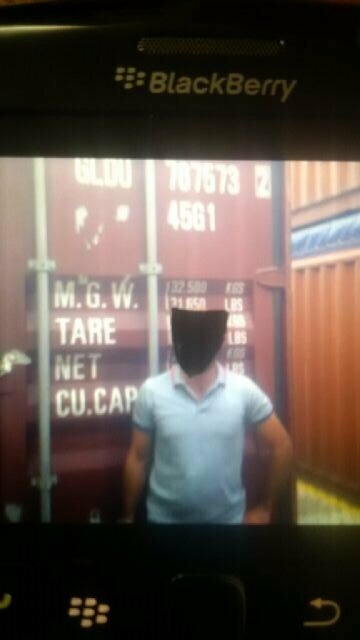 Il Porco, the corrupt customs or police official at Gioia Tauro port, has still not been identified by Italian police. Nicola and his sons are active in Brazil where Nicola’s wife is also thought to be hiding. It is not known how Nicola looks like today. Passport pictures that he has used show a friendly but plump face. Patrick is now also wanted by Italian police. Just last year, he registered a small trading company called Poli Pat 9 at a law firm in Ferraz de Vasconcelos, a poor area of Sao Paulo, corporate registry obtained by CORRECTIV and irpi.eu show. The area is believed to be a money laundering hub of the PCC drug traffickers. This is the last trace the Assisis’ have left.